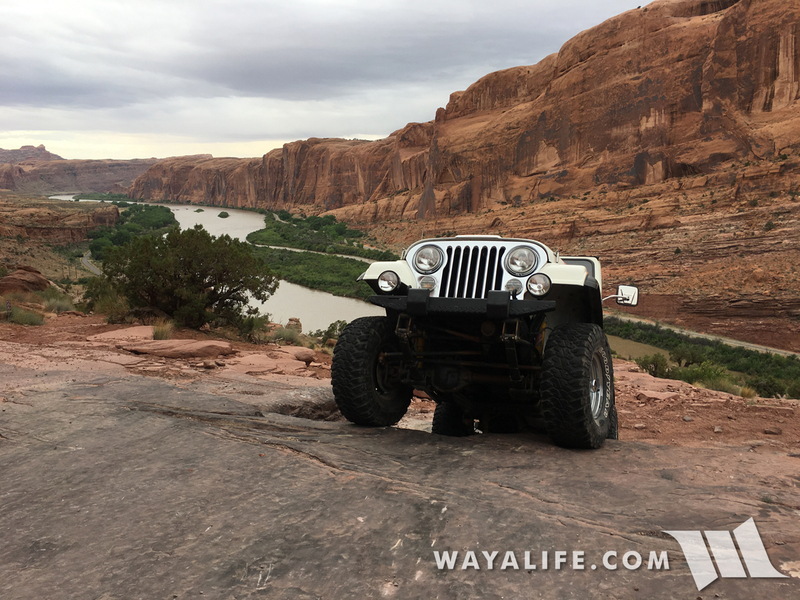 Back in the good ol' days, the engineers over at Jeep used to take a week off of work during the month of May and spend it out in the promised land - Moab! 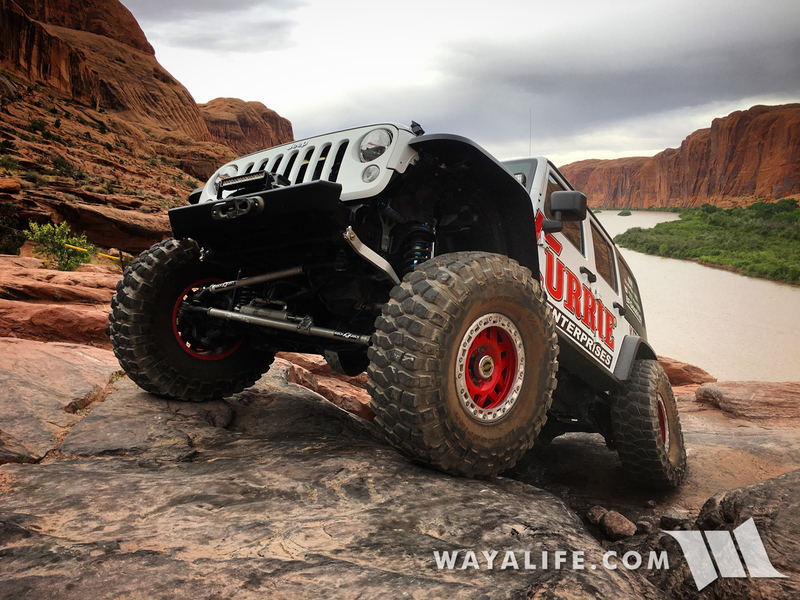 It was a NO work, NO stress week of wheeling with friends and family and only vacationers need apply. 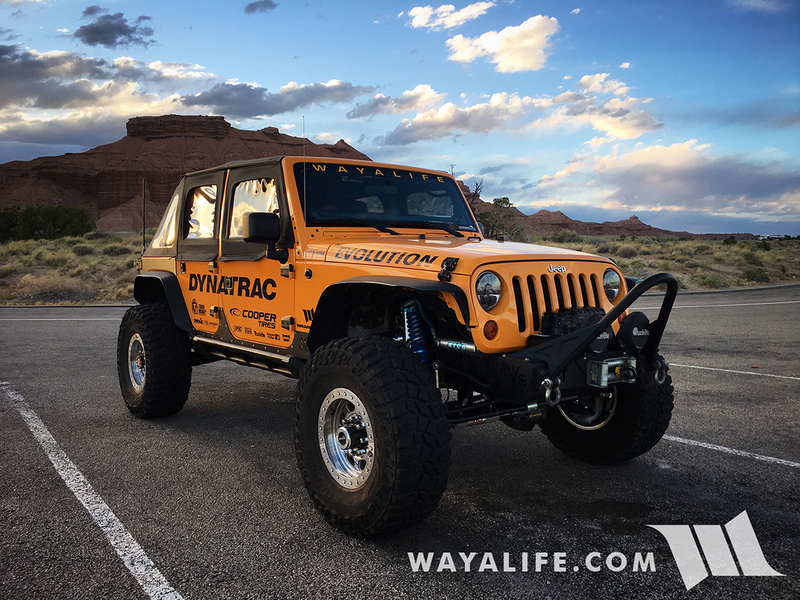 Unfortunately, it'd been almost 10 years since they were able to do something like this and that was something our good friend Jim Repp, the Vehicle Development Manager for Wrangler, was determined to change. 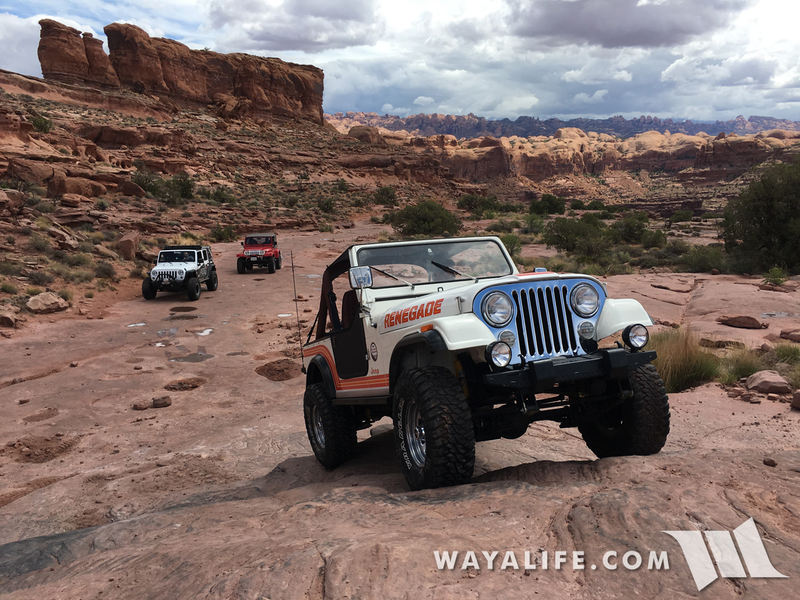 Needless to say, in 2017, the guys and gals responsible for making what we love to drive, revived their long tradition of wheeling out in Moab, on their own time, with their own rigs and as luck would have it, Cindy and I were invited to join in on the fun. 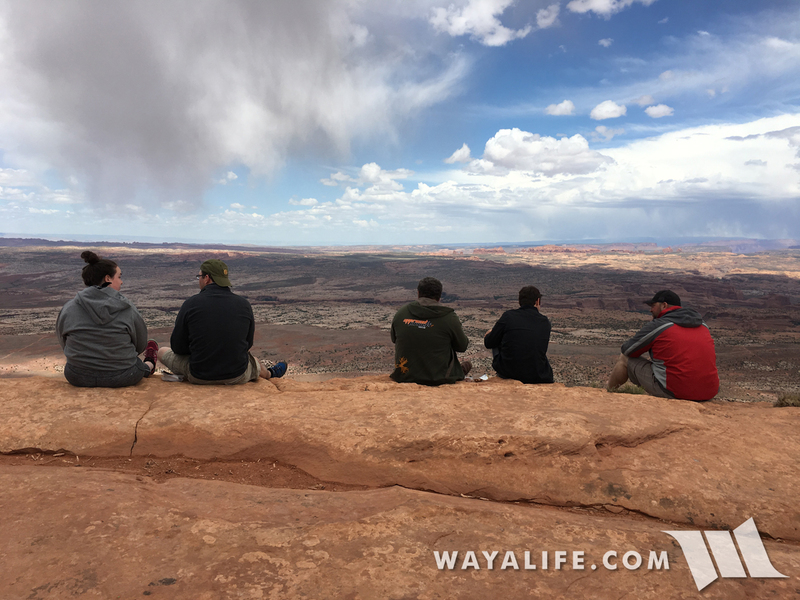 I hope you can be forgiving for the lack of photos we took as we spent most of our time filming this trip and will be making a video of it. 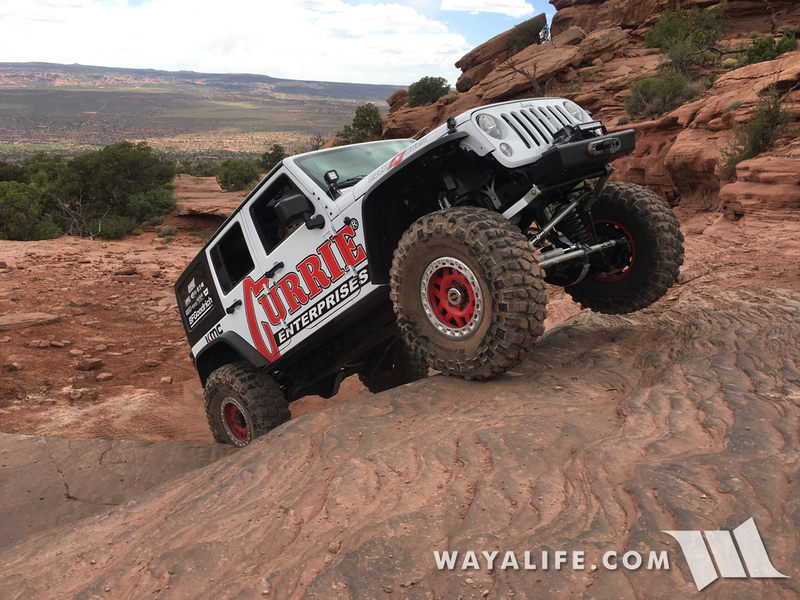 That being said, here are a handful of pics that we were able to take as well as a few that our good friend Tony Carvallo took and was kind enough to share. We hope you enjoy. 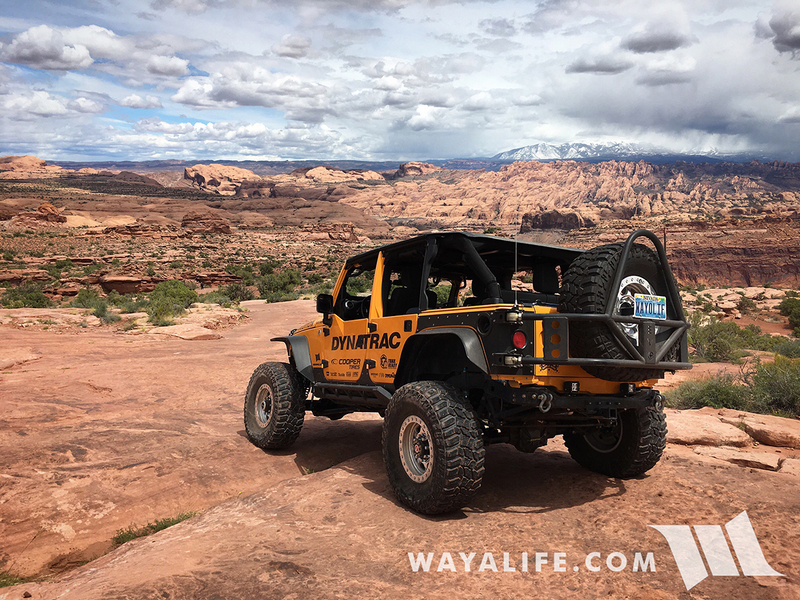 Being that we just took Rubicat out to Moab a few weeks before, we decided to take Moby out this time around. Here's a shot of him all packed up and ready to go. 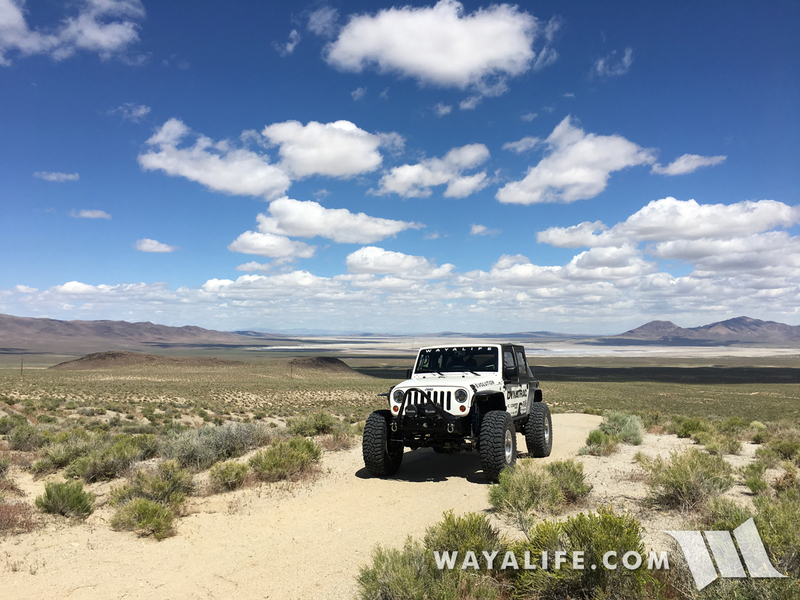 Couldn't ask for a nicer day to be driving across Nevada. 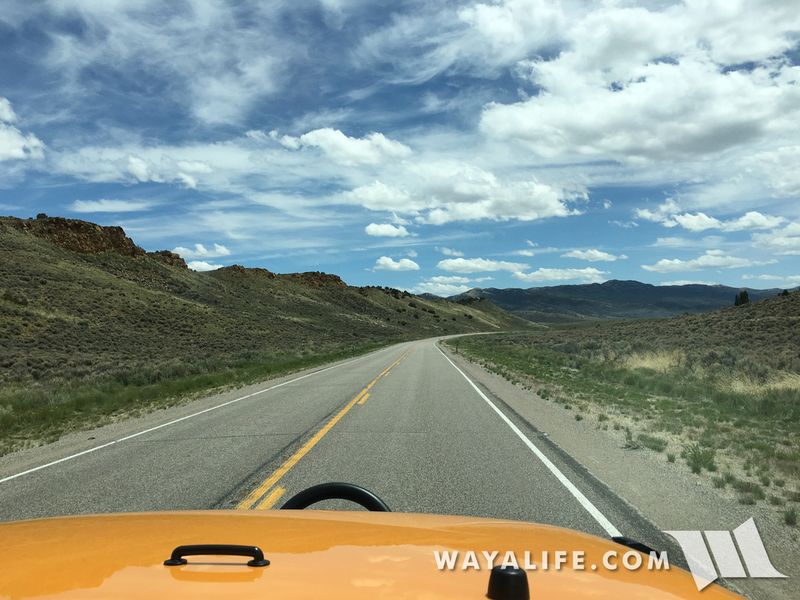 Being that we were heading out early, Cindy and I decided to step off the pavement and take a few back roads along the way and just for fun. Mission control - we have a problem. 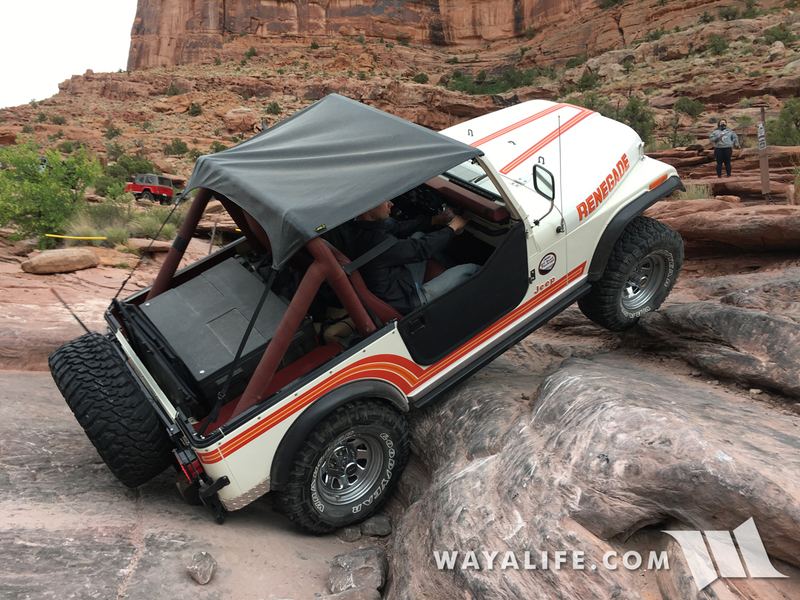 Climbing up a long steep grade, Moby's engine simply cut out and we were dead in the water. While we were able to get the engine started, we had no transmission and our Aeroforce Interceptor was fried so we weren't able to pull a code. 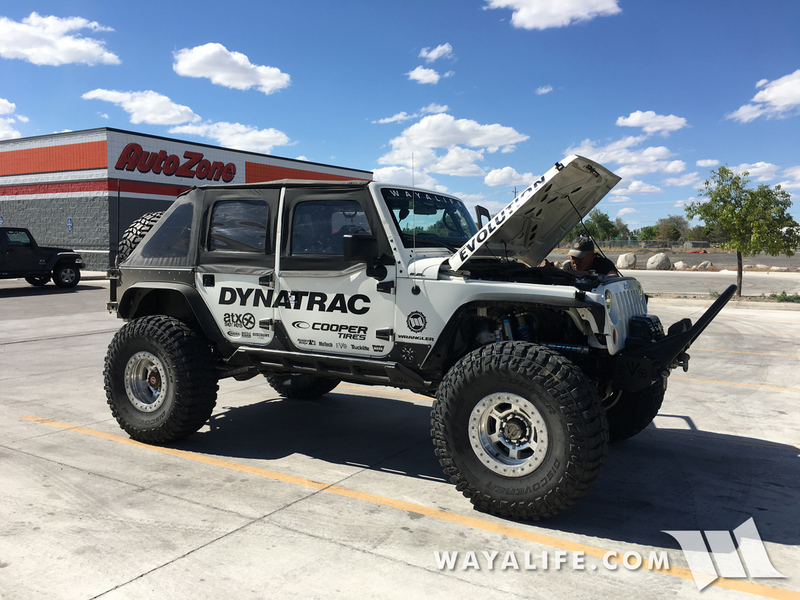 After verifying that we had sufficient transmission fluid, the shifter linkage was all good and that none of the fuses were blown, I pulled the negative battery cable to try and clear any codes there might be and with the hopes that it would help things out. 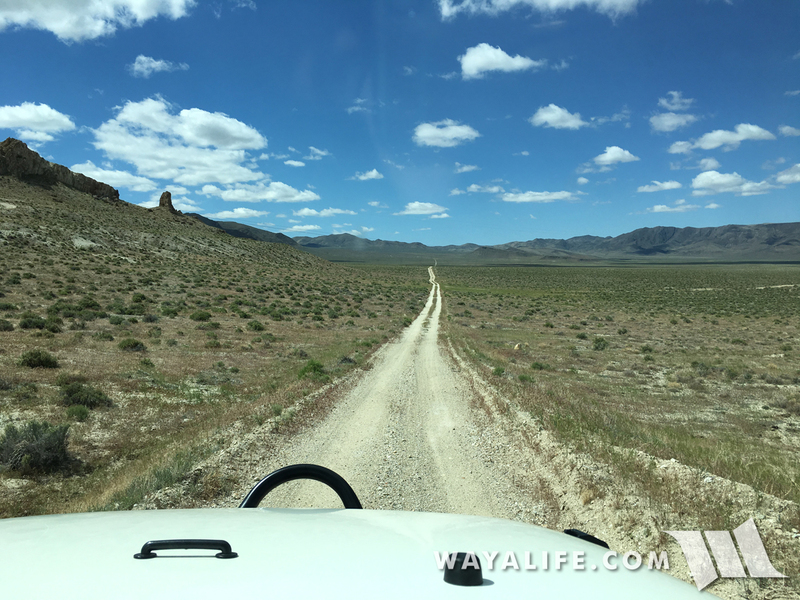 Unfortunately, it didn't and we were still stuck up on this desert mountain. As luck would have it, if I walked down the trail a bit, I just had enough signal on my phone to get a text out to Robbie at Motech and fortunately, he was up and around on a Saturday morning to help me out. 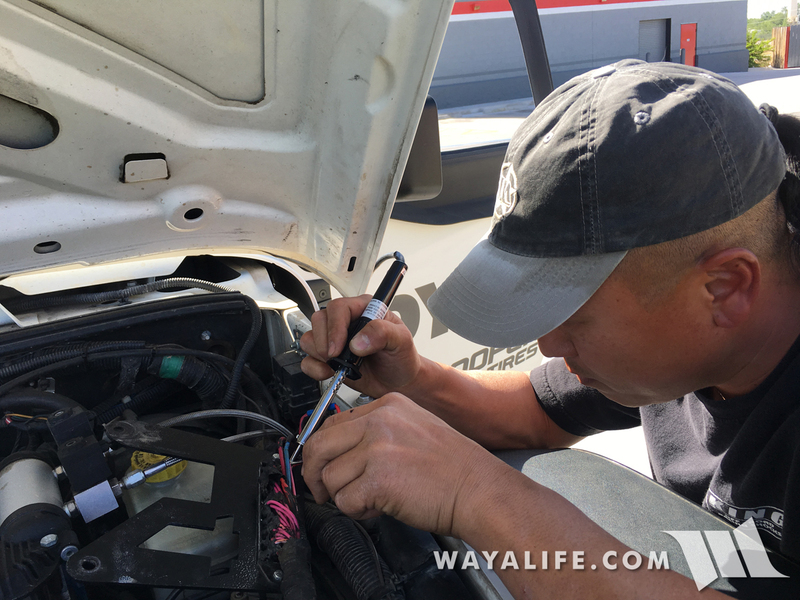 With his help, I checked and wiggled the wires around on the fuse block and that got our transmission working again. 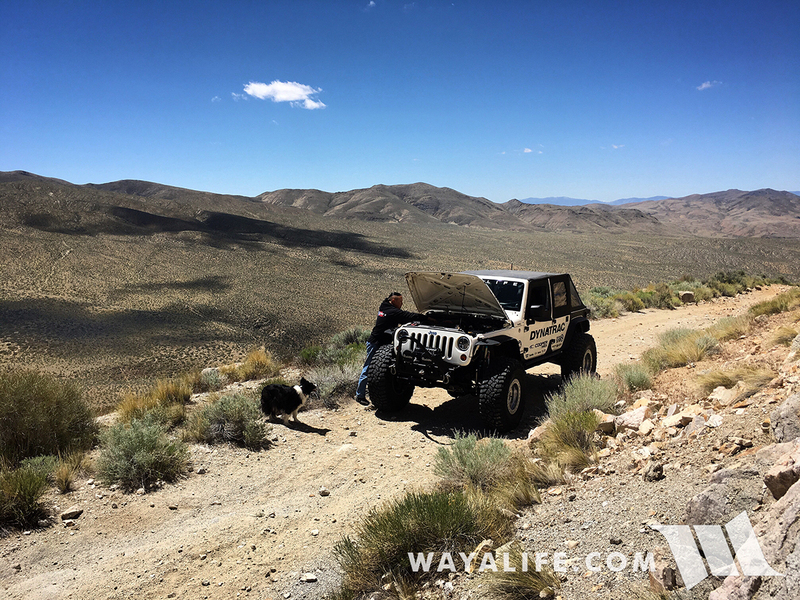 Unfortunately, that only got us going for about 2 miles and we lost our transmission again after stopping to check out a deep rut we needed to traverse. 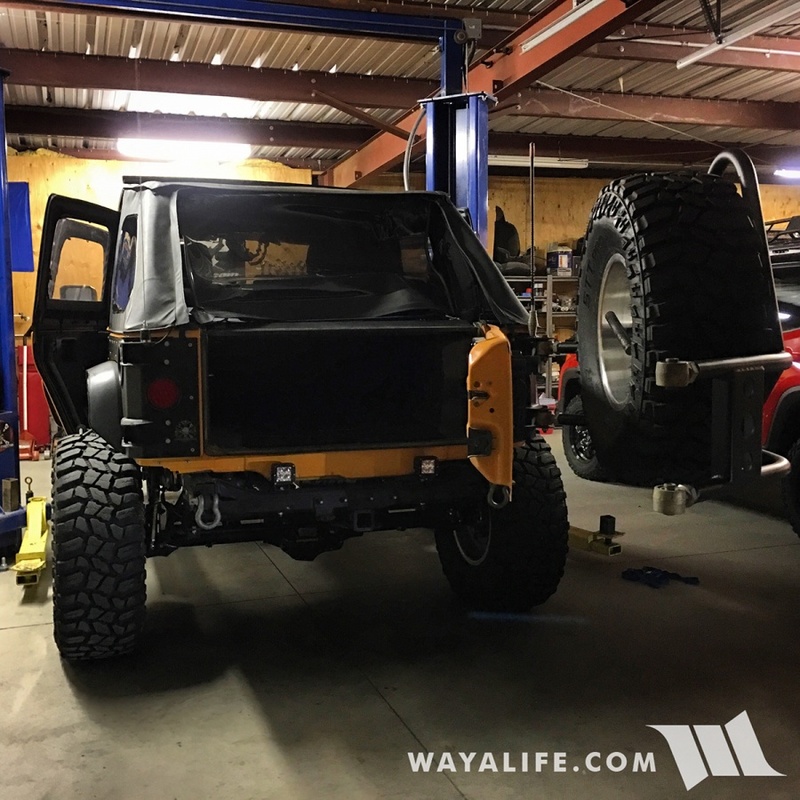 This time around, I decided to unbolt the fuse block and give things a closer look. After pulling away some of the liquid insulator, I found this. Lacking a soldering iron to make a solid field repair, I did what I could with the electrical repair supplies I had and slowly but surely, we hobbled our way off the mountain, back on to pavement and all the way back to the nearest town, 5 to 10 miles at a time or for however long our engine and transmission would keep on running. 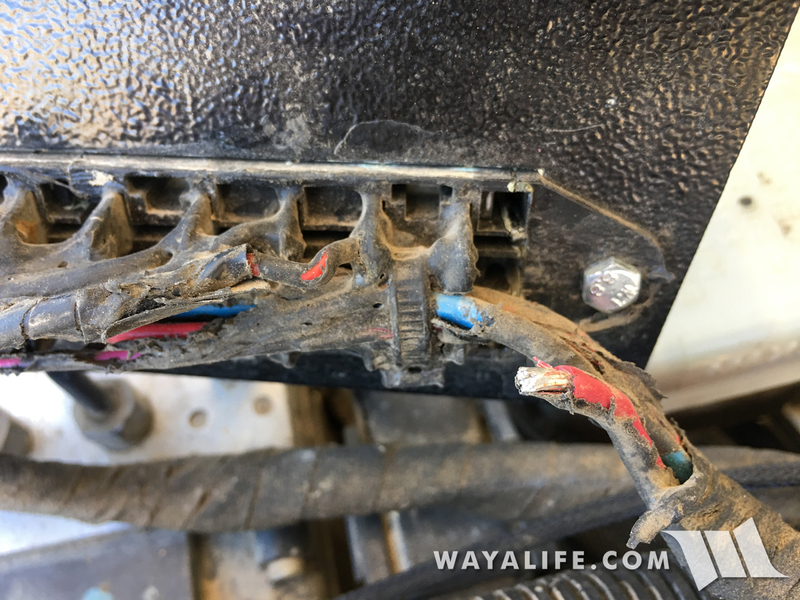 Once in town I was able to pick up a soldering iron at an Autozone and make a better but far from perfect field repair. 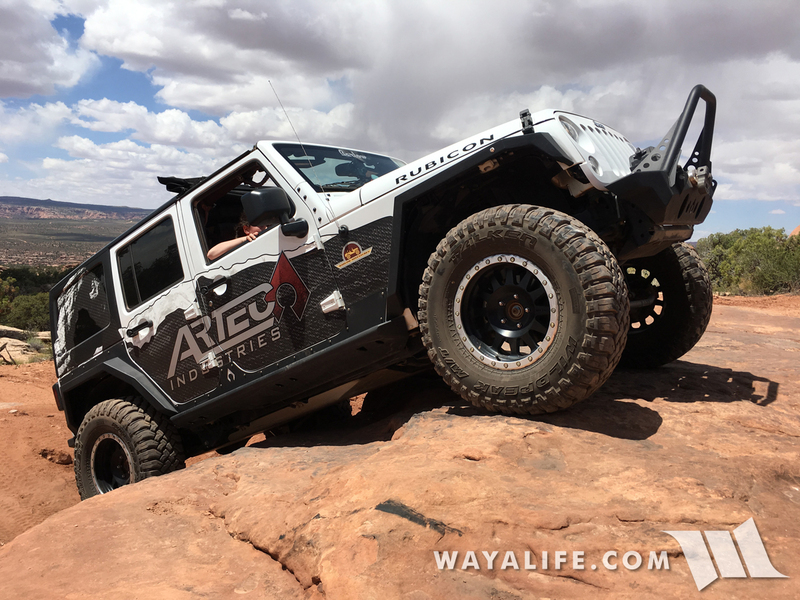 While the repair did help some, we still seemed to be running in a limp mode and could only go about 20 miles at a stretch before we started having issues again. 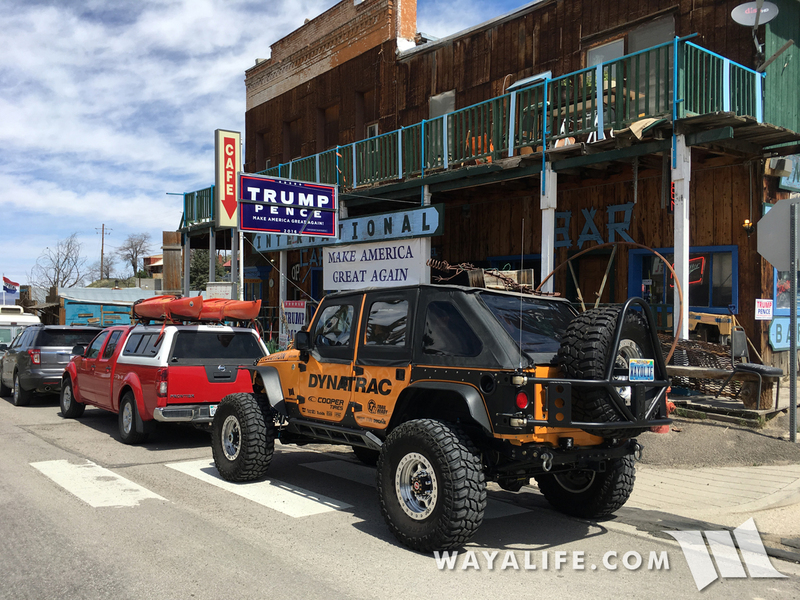 Once we were closer to home, we called our son to lend us a hand and used our Duramax to help bring Moby in. 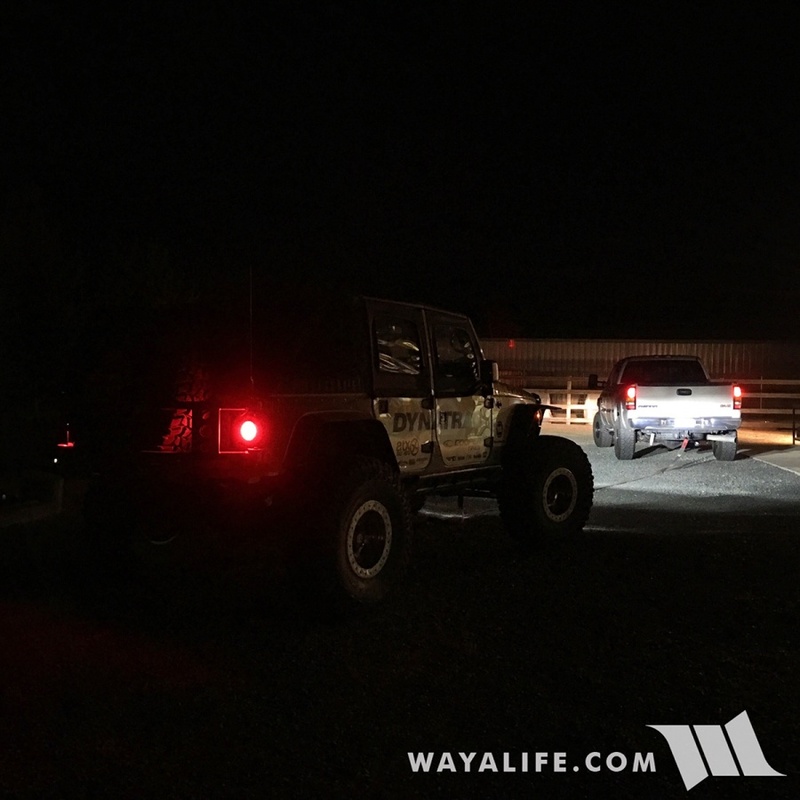 Although it was now about 2 AM on Sunday morning, we transferred everything we had packed in Moby into Rubicat before having a stiff drink and calling it a night. 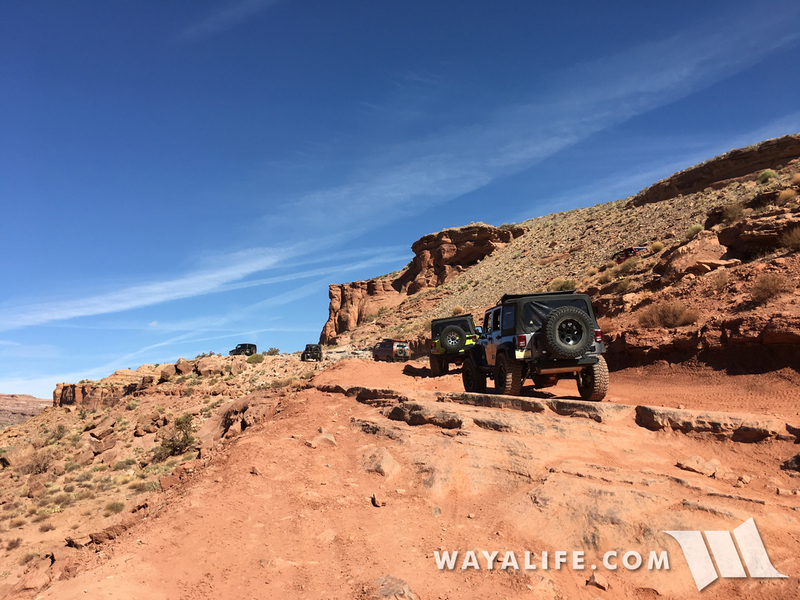 After getting about 4 hours of sleep, we climbed into Rubicat and got ready to start our long trek out to Moab... again! 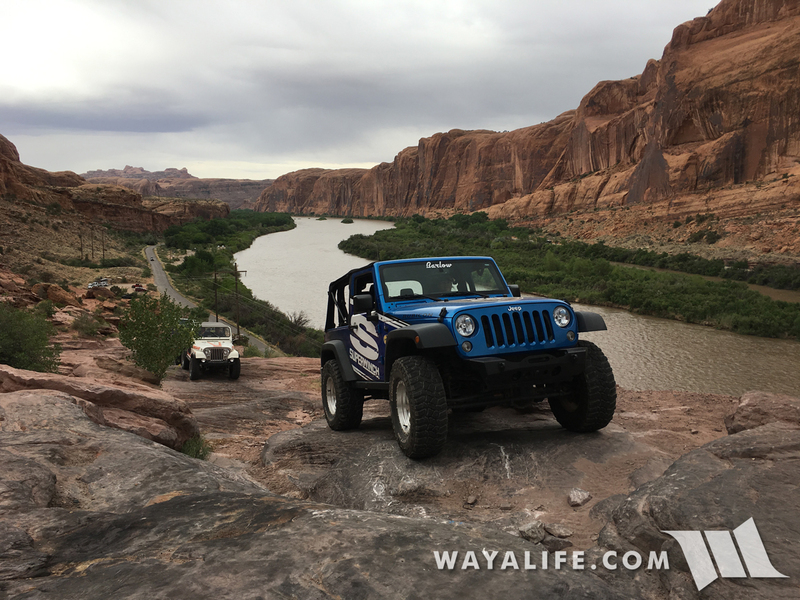 Thanks to our adventures the day before, we now had to make our whole drive out to Moab, in just one day. 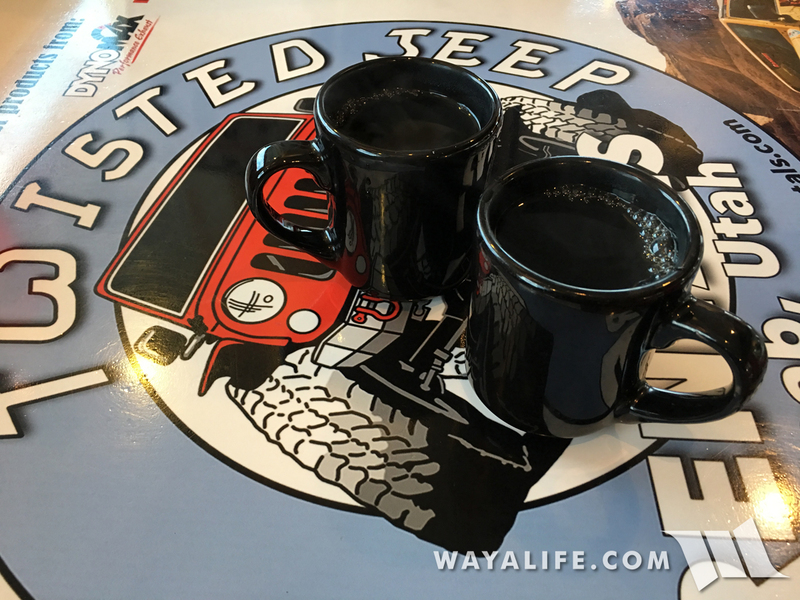 Driving through Austin, we stopped over at the International Cafe. I hear the portions are HUUUUUUUUGE here. I wanna be a cowboy! 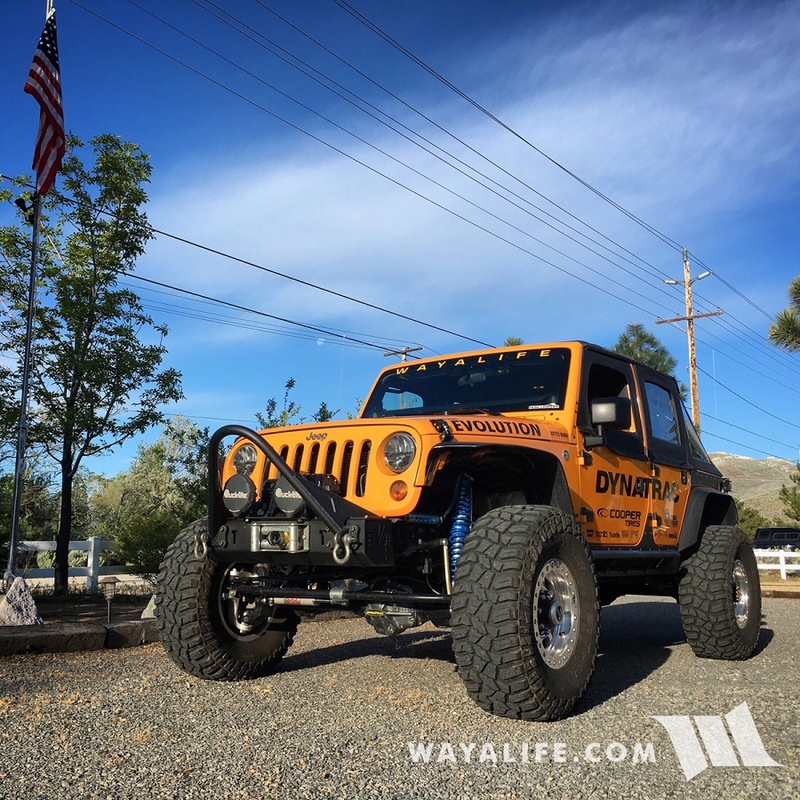 Rubicat posing for a quick shot in Eureka. 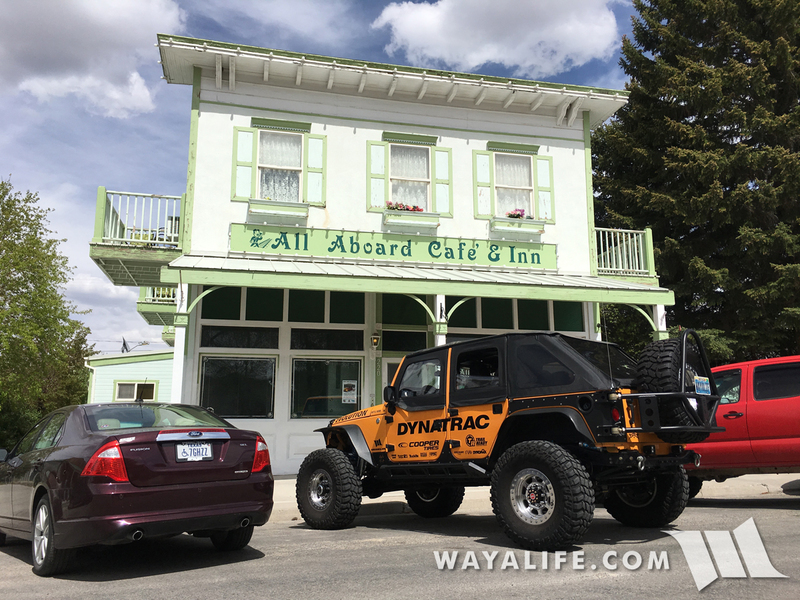 In Ely, we stopped for a bite over at the All Aboard Cafe. And at long last, here we are - the promised land! 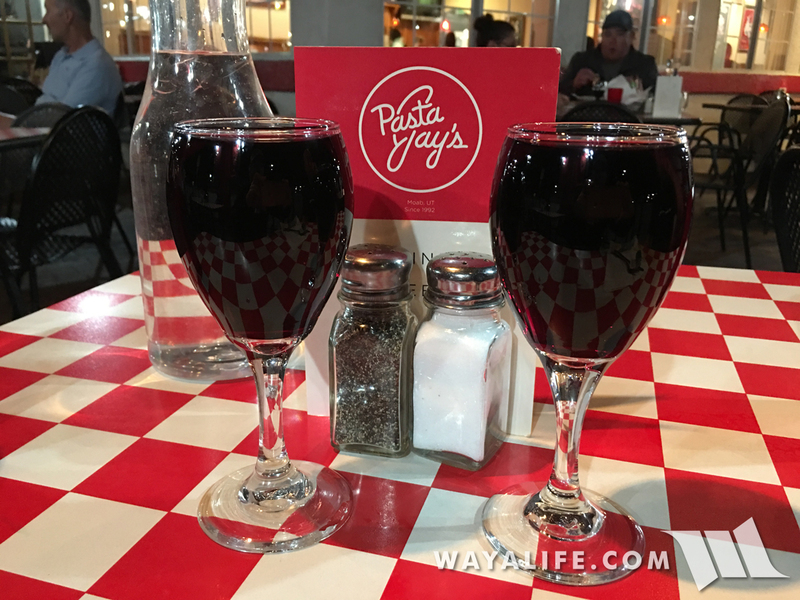 Thank goodness that Pasta Jay's stays open late. 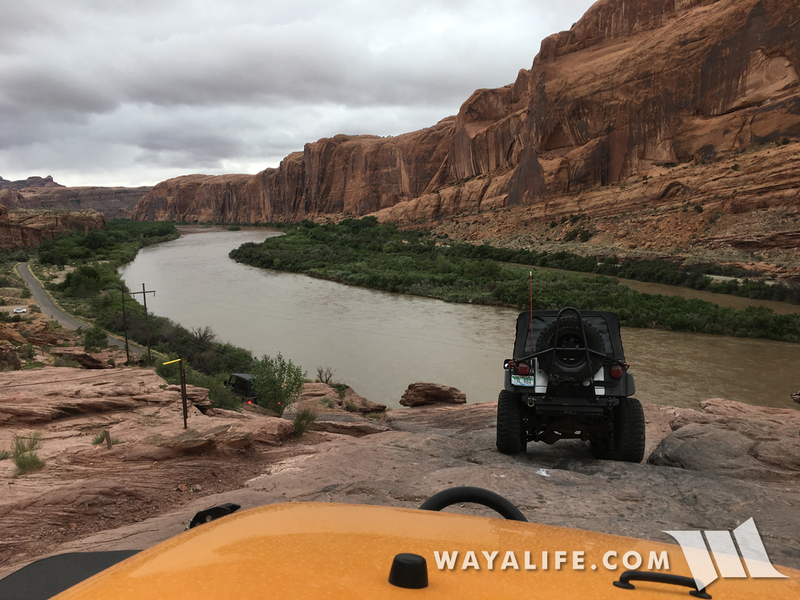 There were times where I had started to question if we'd ever make it to Moab but after a crazy long weekend, here we are - at the Moab Diner, bight and early in the morning and ready to meet up with everyone. 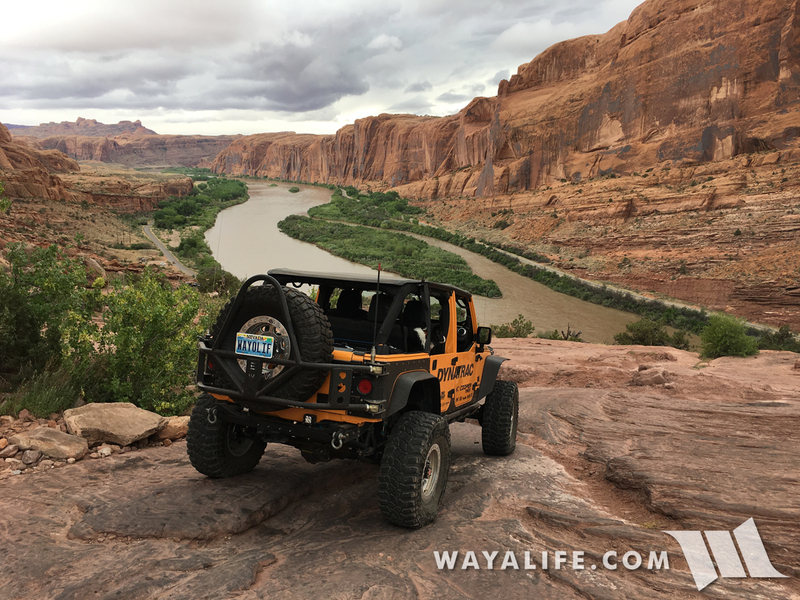 If there is one thing that is a bummer about coming to Moab, it's that you lose an hour being that it's in Mountain Time. Not really a big deal if our condo hadn't been double booked, had to jerk around with the management company the night before and we were able to get to bed at a reasonable time but hey, that's what coffee's for! 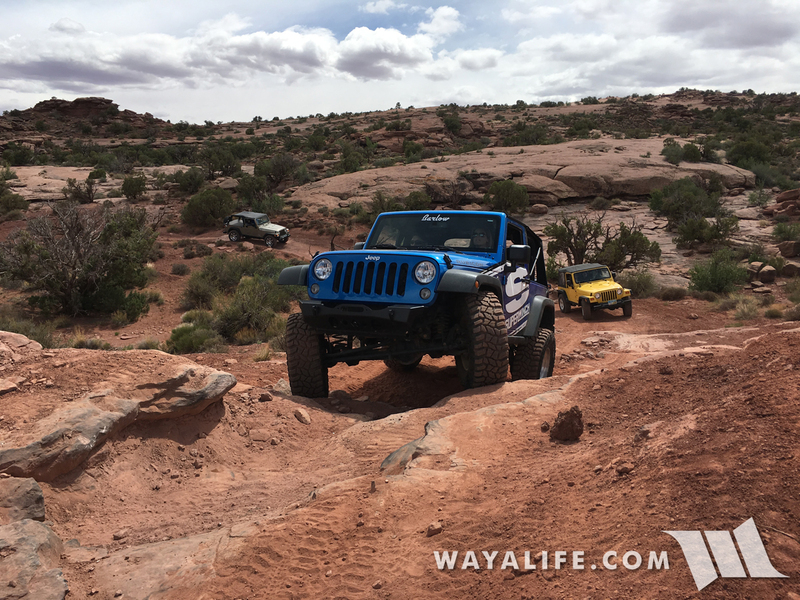 After filling up our bellies and getting a chance to meet some new faces and catch up with some old, we made our way out to the Poison Spider trail head and got ready to have some fun! 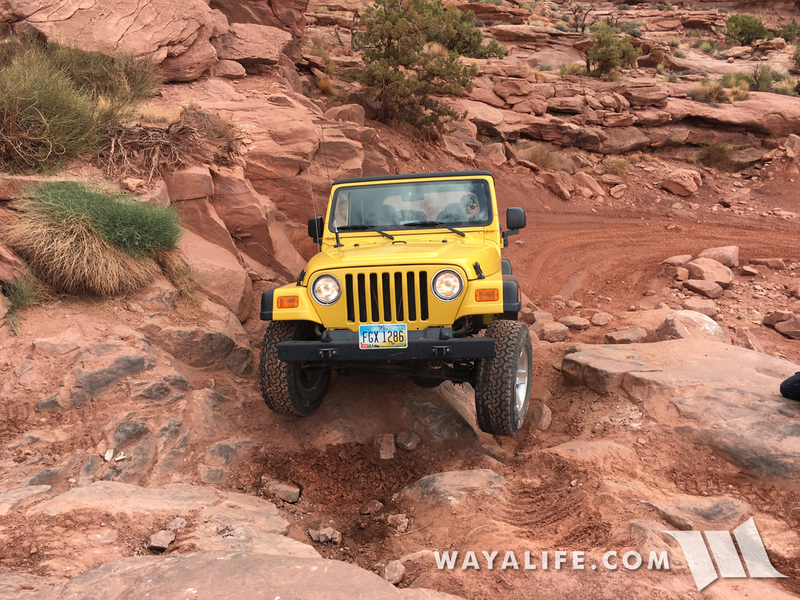 Starting our climb up the switchbacks that take you up to the mesa. 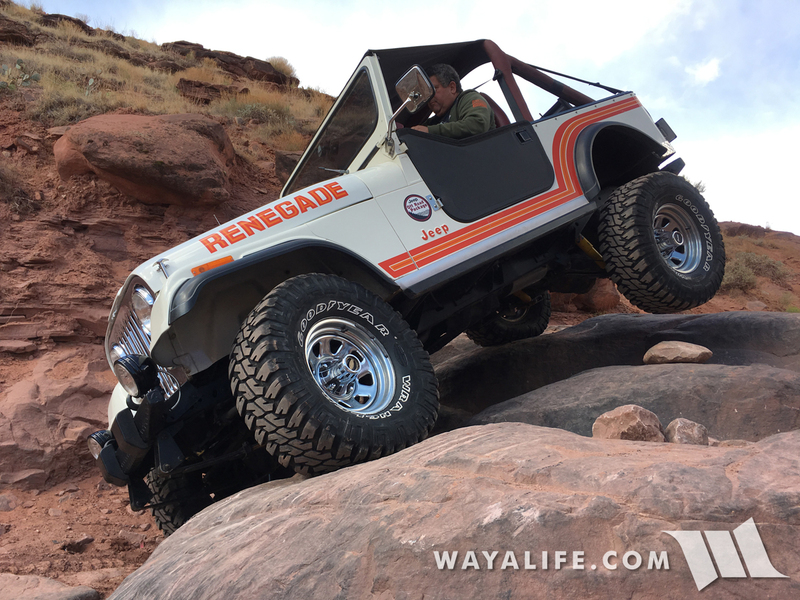 Of all the Jeeps that came out to Moab with us, this sweet 1985 CJ7 that belongs to Jim Repp was not only the oldest in our group, it was also a total sleeper that rocked everything you could put in front of it. 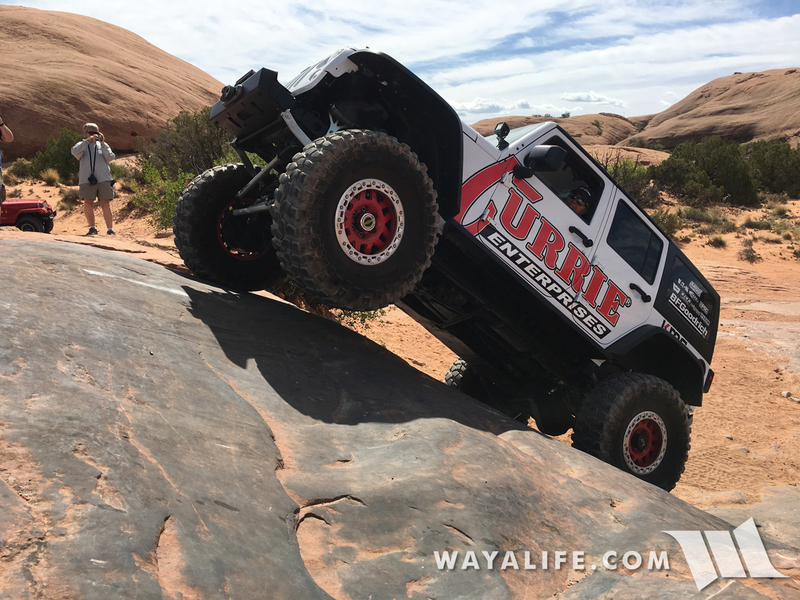 Rubicat having some fun on the first of many slickrock domes. 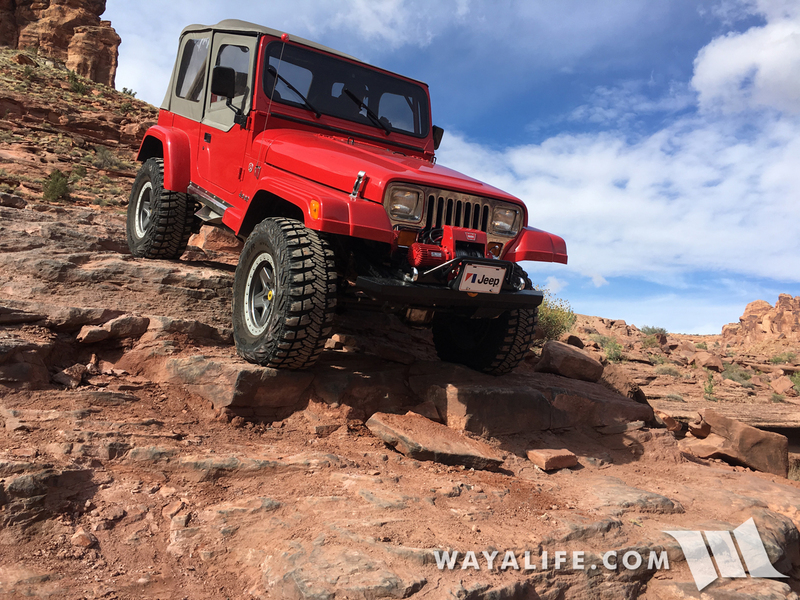 Dave Thompson owns this super clean 1992 supercharged YJ riding on long arms and ORI struts and it is without question, the nicest one I have ever seen. 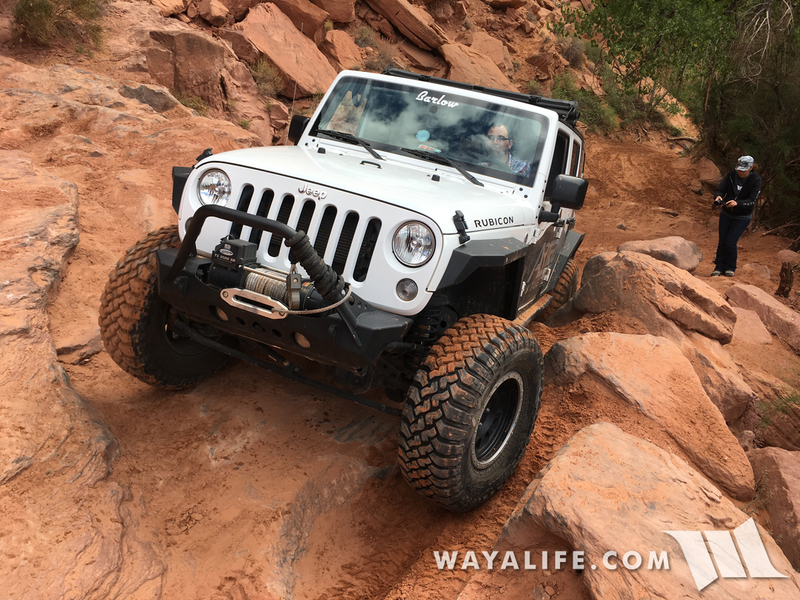 It was nice that John Currie was able to join us out in Moab in his nicely built JKU. OH NO - How will it end?! Here's a short video that will show you. 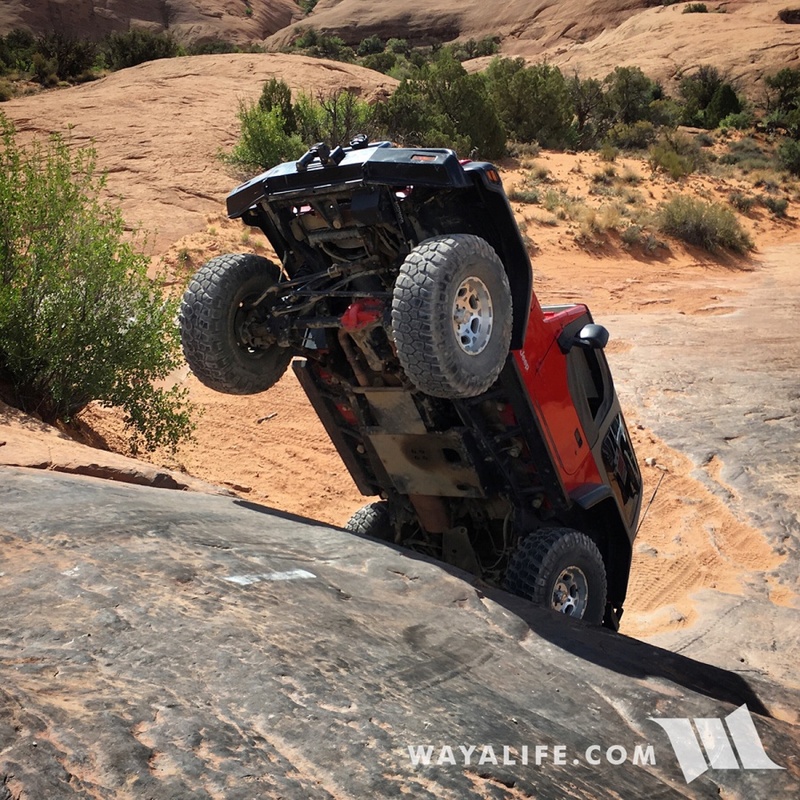 I should note that Dave Logan is an expert on old iron, a long time wheeler and someone who's done this obstacle and without incident many times before. If I could guess, it's because of it that this happened and in spite of what all the Monday night quarterbackers will say, this is literally something that can happen to any of us. 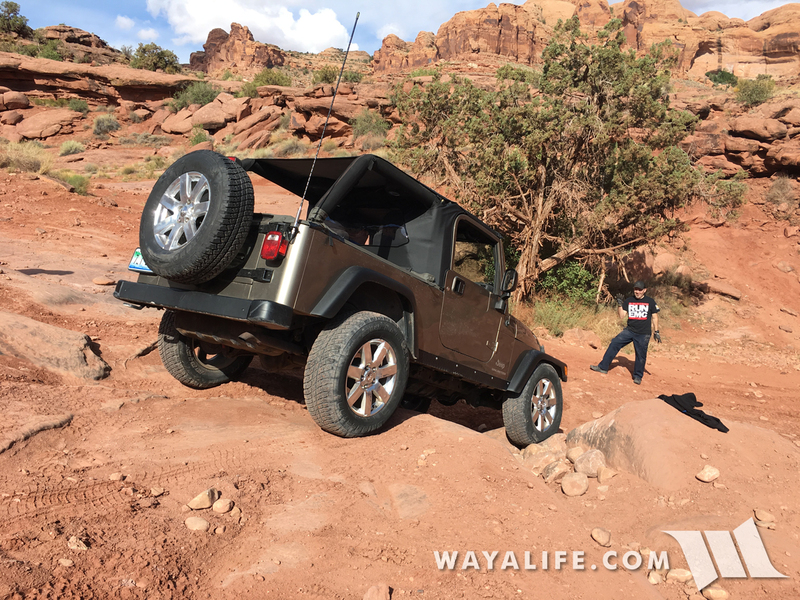 Fortunately, everyone was okay and with the exception of his hard top, his Jeep came out of the flop pretty much unscathed. After getting him back on his feet and getting everything cleaned up, he decided it might be best to turn around, head back to town and do what he could to fix his top. 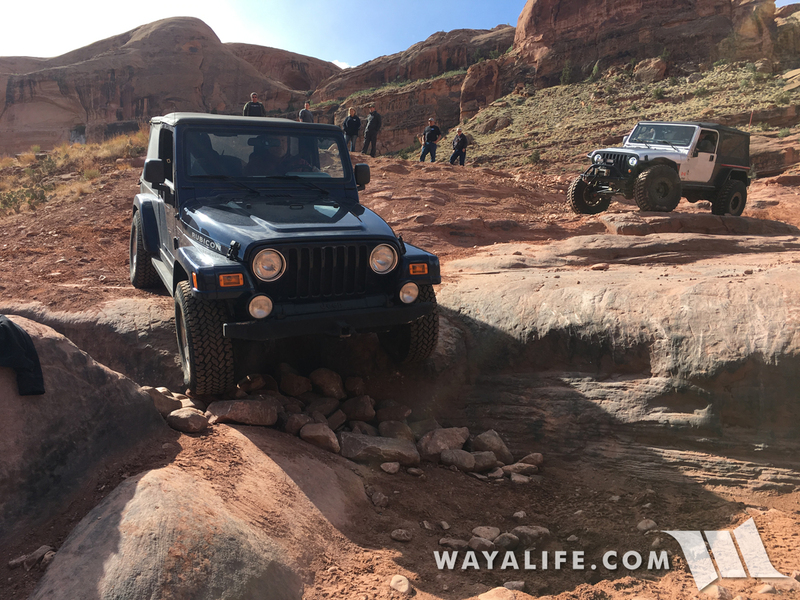 After all, we still had a week of wheeling ahead of us. 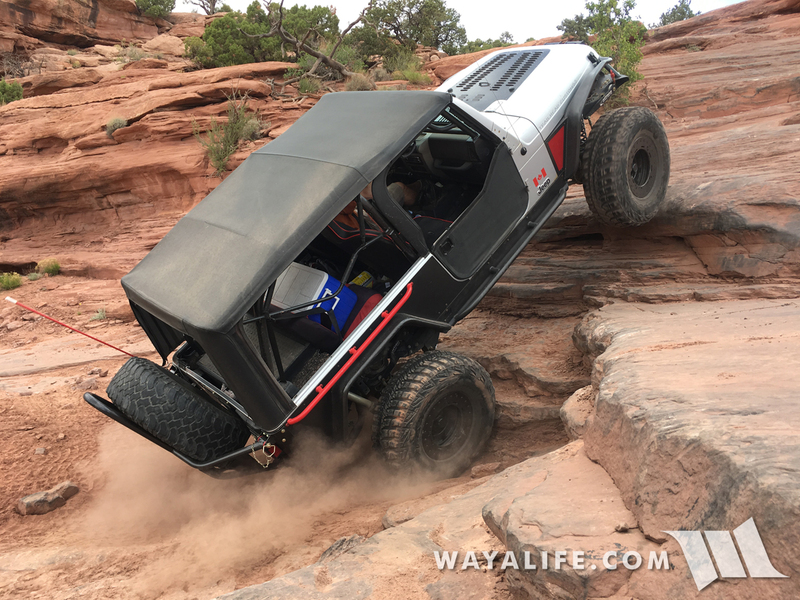 A lot of the guys who came out to Moab were retired Jeep engineers who'd been with the company long enough to have worked on projects like the ZJ and WJ Grand Cherokees. 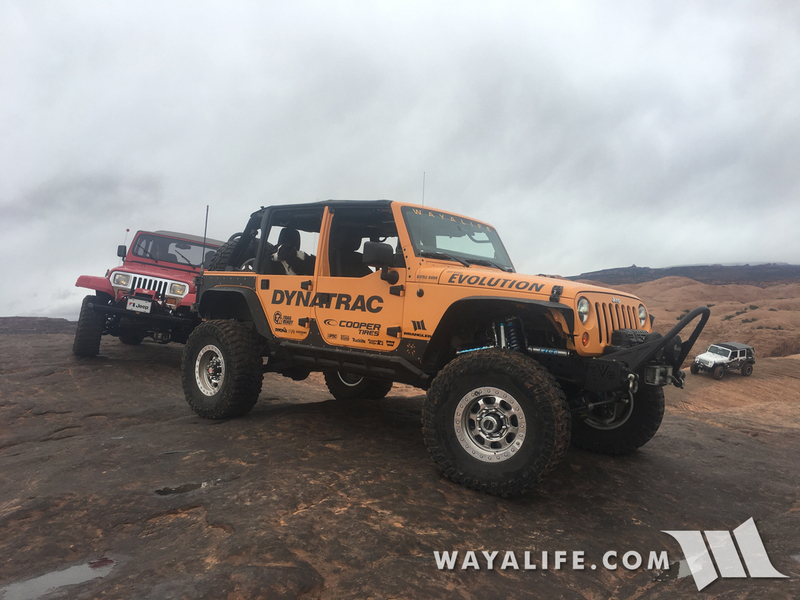 Phil Toney was one of these guys and he came out to play in his bone stock JK Wrangler. 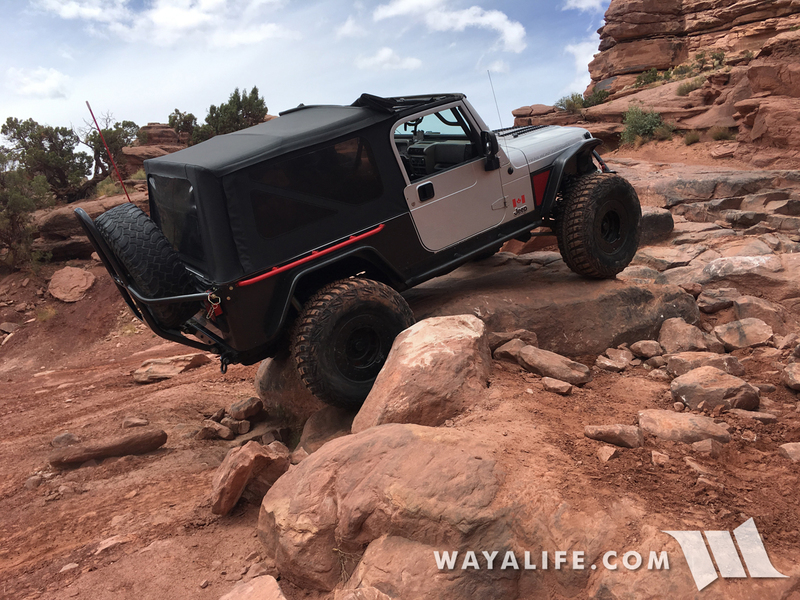 Cindy flexing her way through the Wedgy. 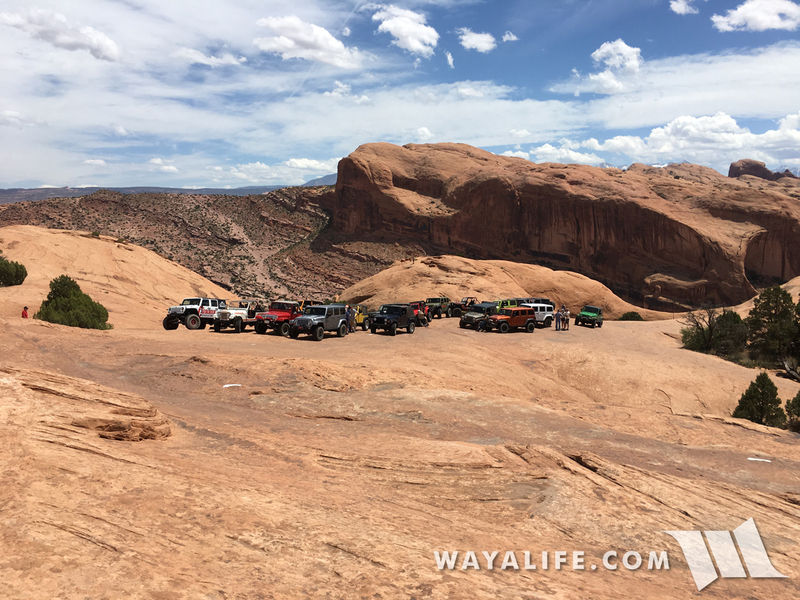 Stopping for lunch over at the Little Arch overlook. 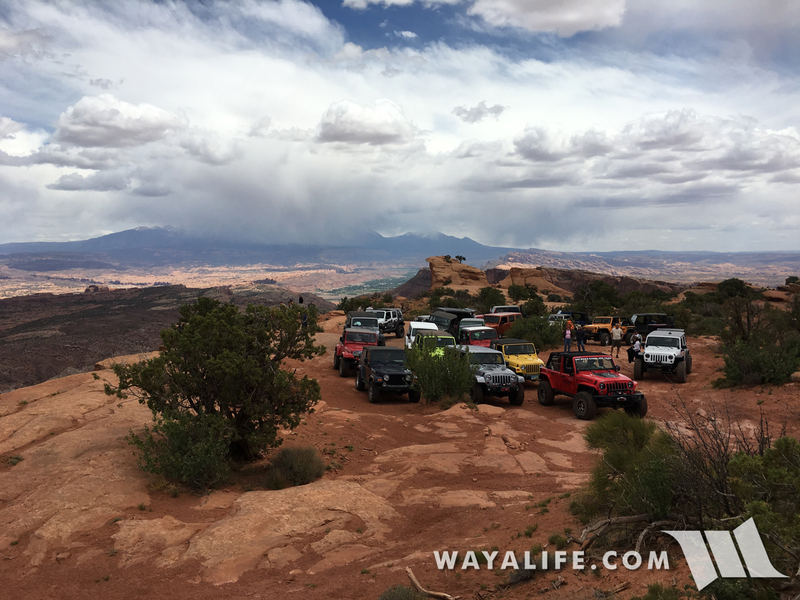 Further up the trail, we stopped over at the Portal Overlook which is at the end of the Poison Spider Mesa trail. Damn crazy Canadians! 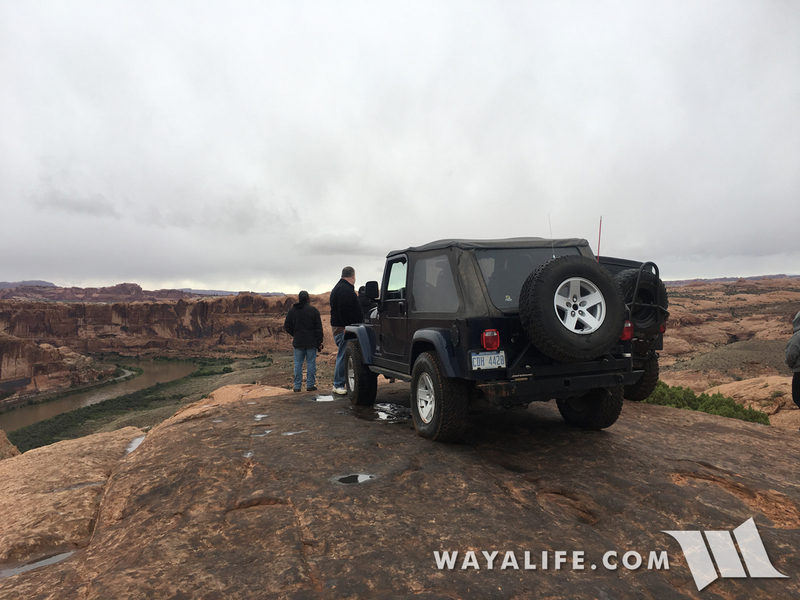 Here's a shot of Aleksander Tonkovich, a guy in charge of customer usage and test schedule development at FCA in his nicely built LJ posing on top of a big rock, right on the edge of the cliff! 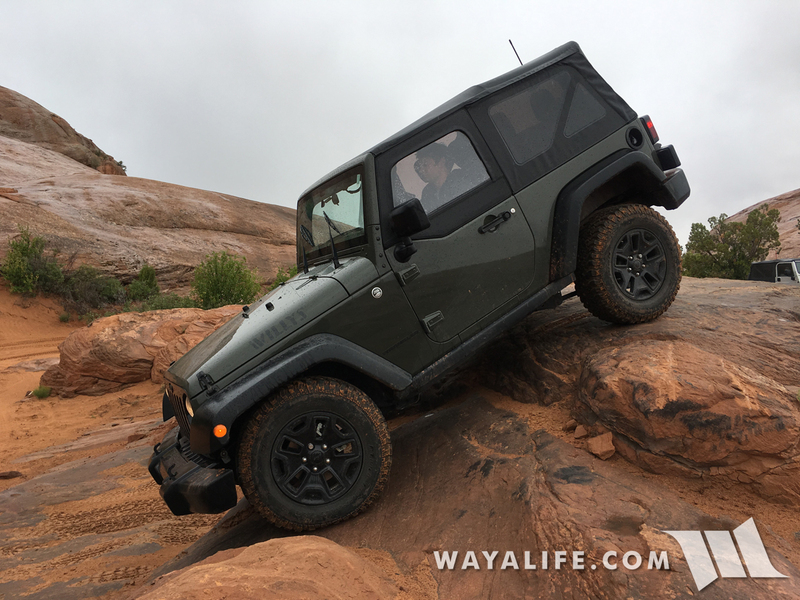 Tony Carvallo, the Wrangler Product Planning Manager over at Jeep decided that he needed to give it a go as well but being that he showed up to Moab without a Jeep, Phil let him use his JK. 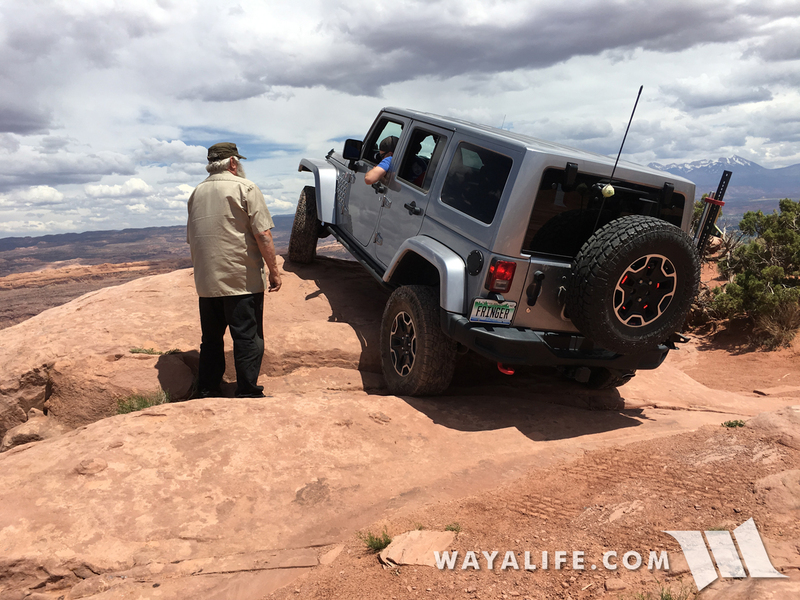 Here's a shot of Mr. Moab himself, the legendary Dan Mick trying to convince Tony to keep going forward. 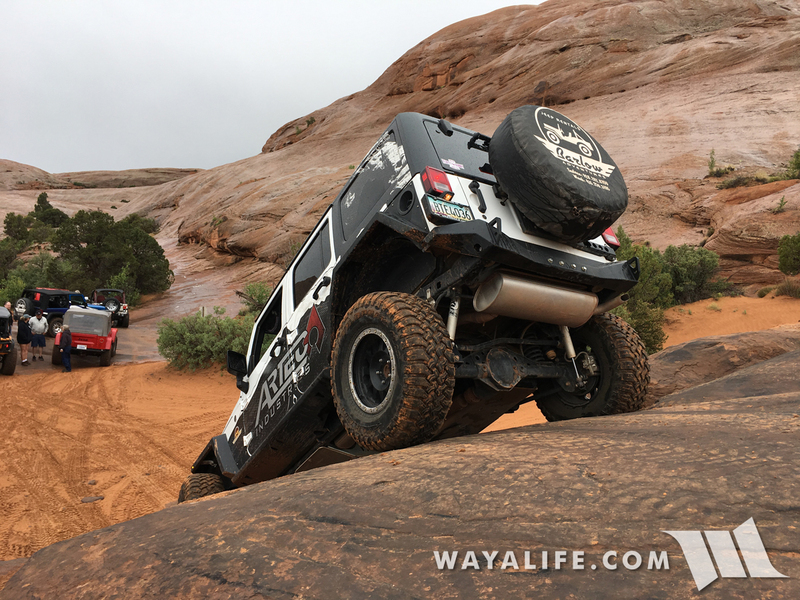 After reaching a point where Tony just couldn't get himself to go any farther, Dan hopped behind the wheel and took the JK right over the edge... LITERALLY! 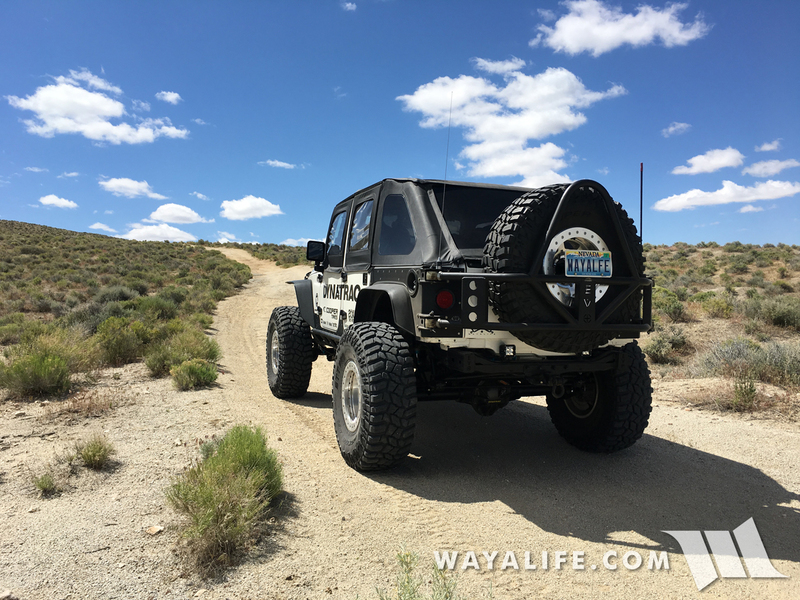 Wrapping up our day by circling around and running the Golden Spike trail backwards. 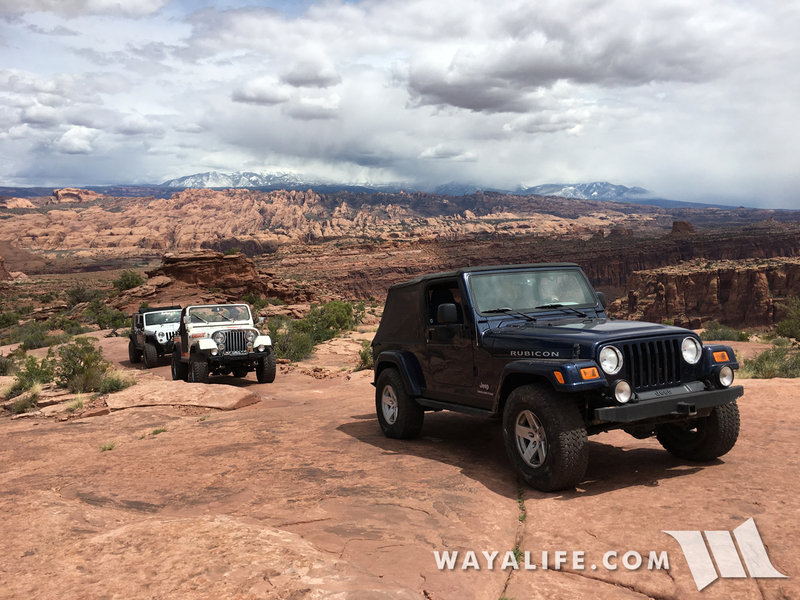 There were a few in our group who weren't able to bring out their own Jeeps to Moab and so we started our second day over at Barlow's so that they could pick up ones they had rented. 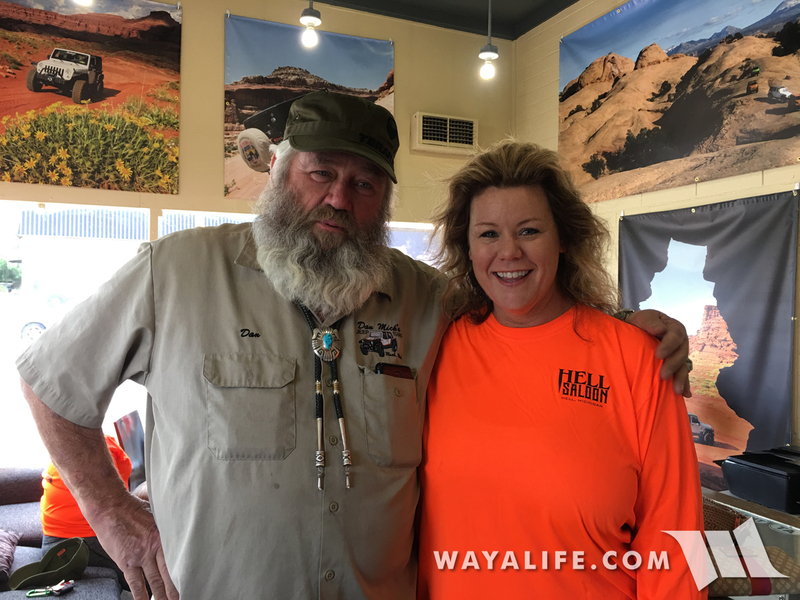 Here's a shot of Dan Mick helping our good friend Denise Weir get setup. 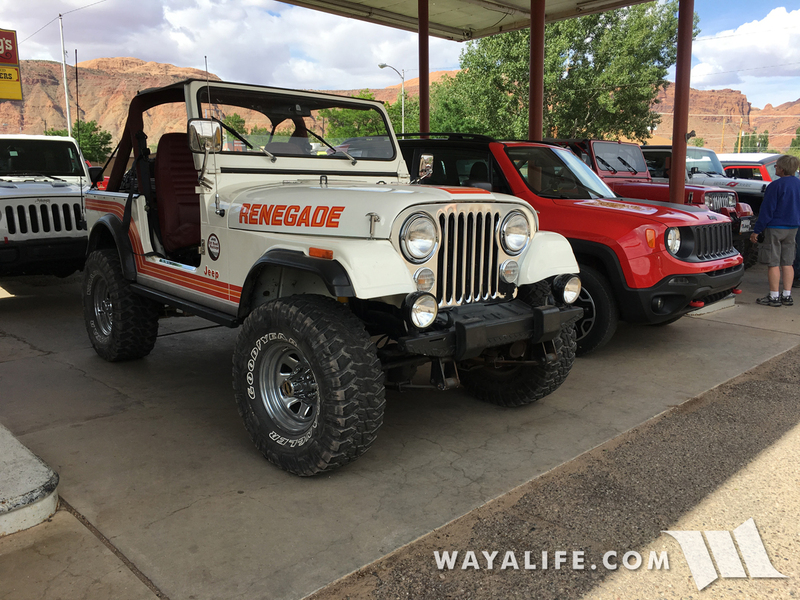 Which Renegade would you want to drive? 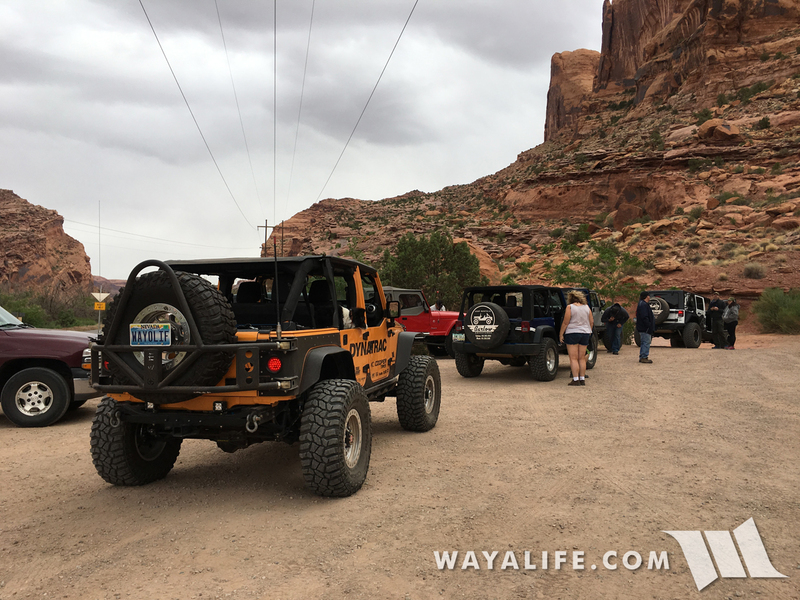 After getting everyone in a Jeep, we headed out to the trail head to meet up with the rest of our group. 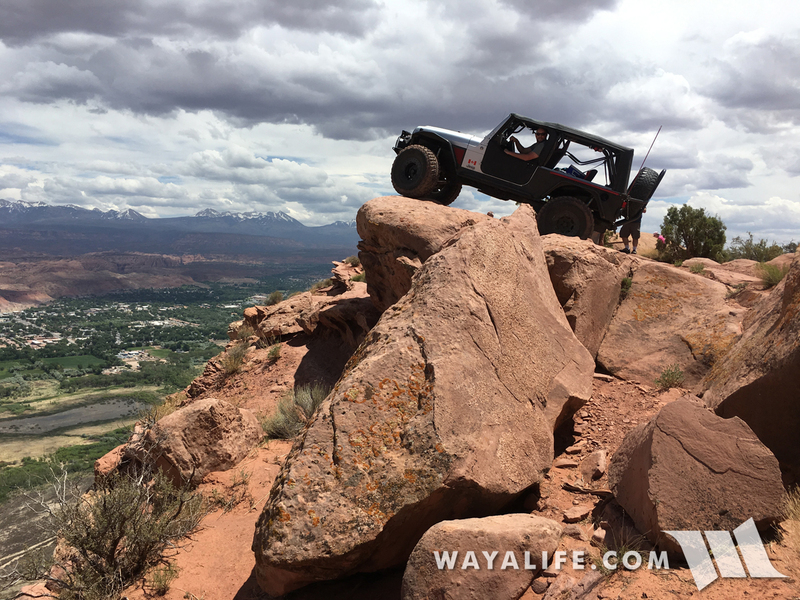 Our run for the day would be on one of my favorite trails in Moab, Metal Masher. 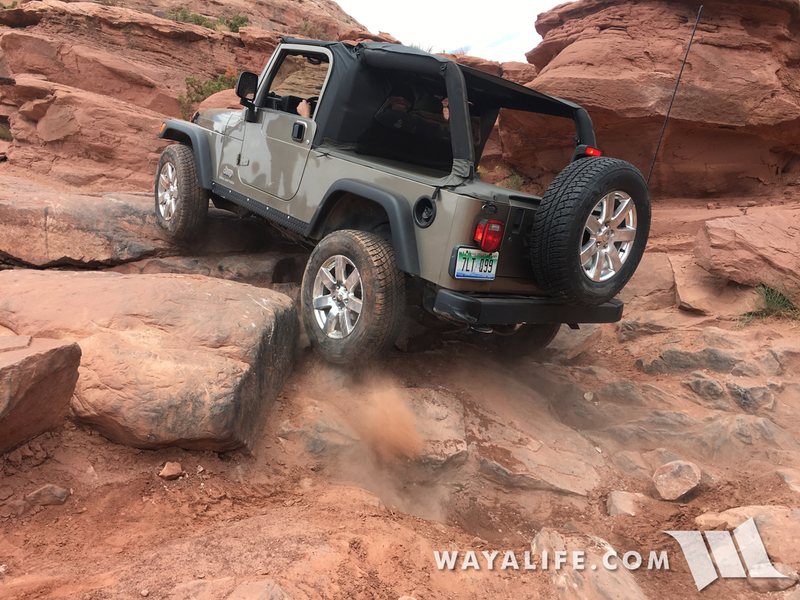 Here's a shot of Denise getting her first taste of wheeling on slick rock in her 2-door rental JK. 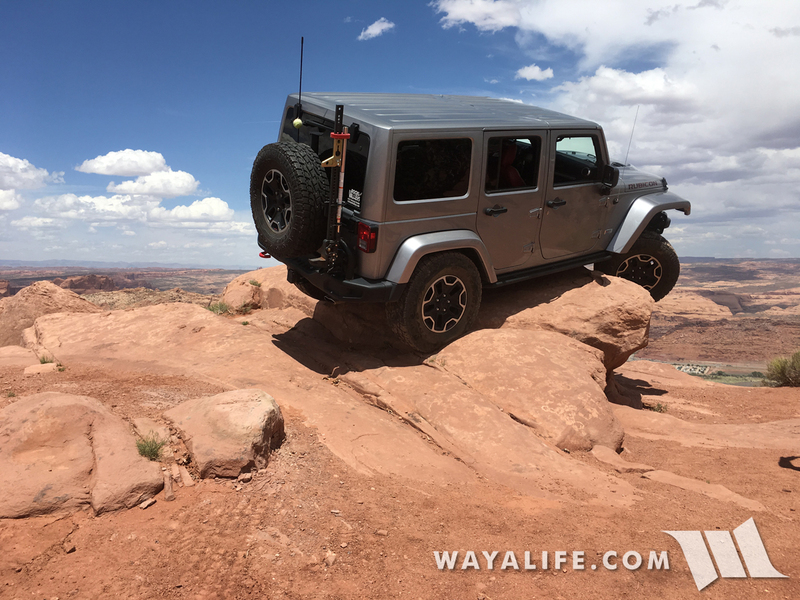 Cindy crawling Rubicat to the top of this ledge. 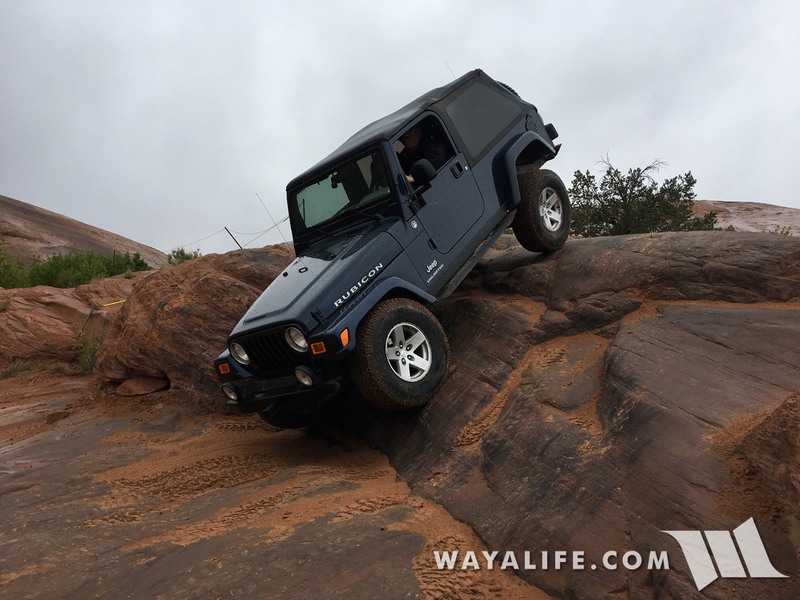 Bob Perkins was another one in our group who rented a Jeep for the day and here he is working it up the rocks. 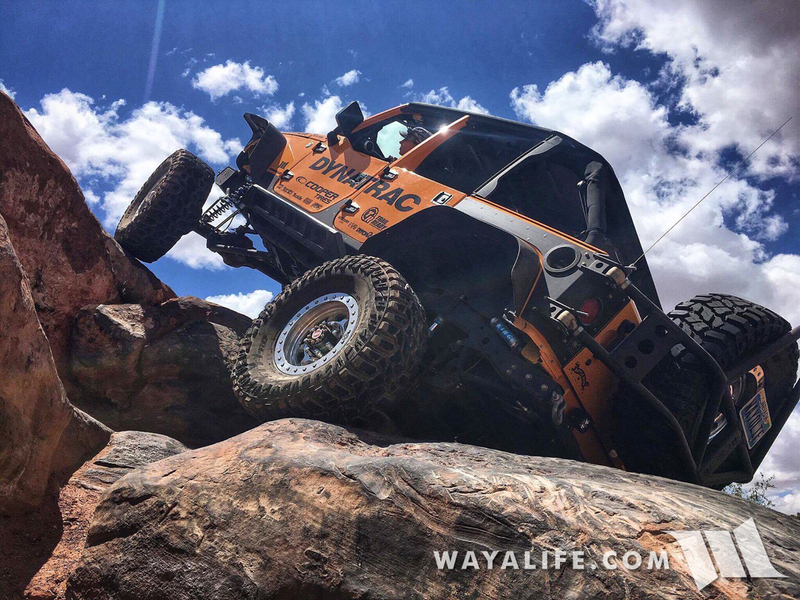 A BIG THANKS to Tony Carvallo for taking this awesome shot of Cindy clawing her way up Rock Chucker! 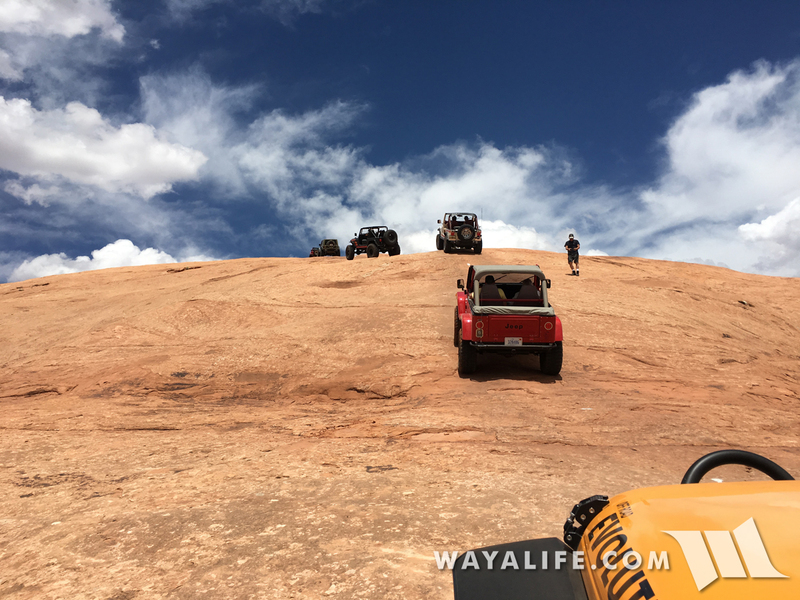 It's always cool to see Jeeps climbing their way up Mirror Gulch. 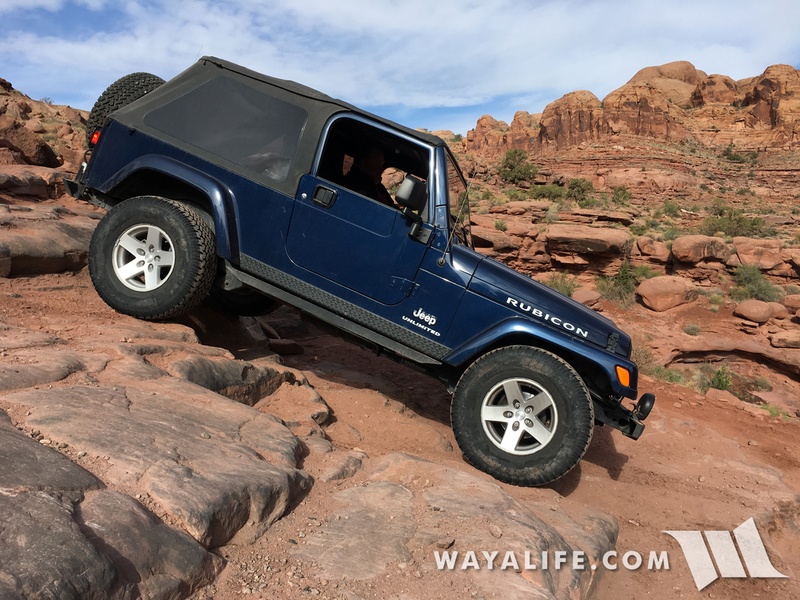 If there's one thing that I've come to learn about Jeep guys is that they're really proud of the vehicles they make. 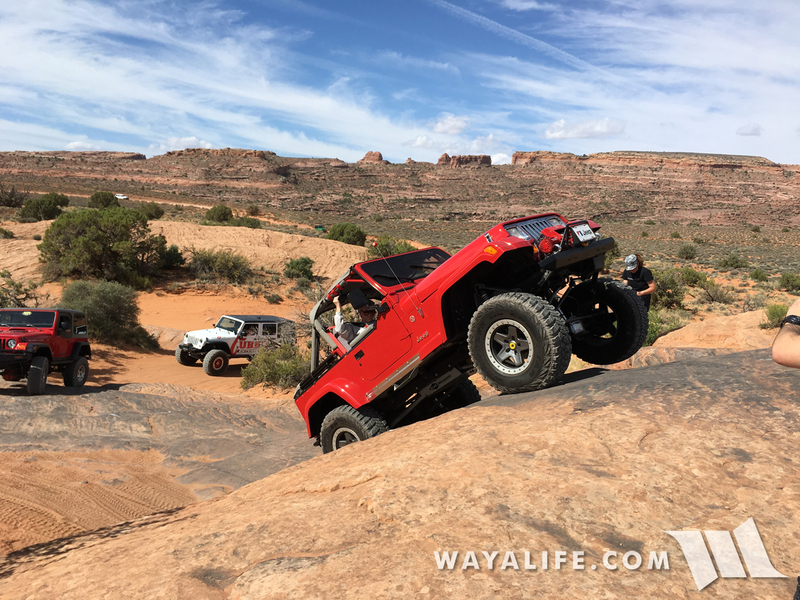 In fact, many of the guys who came out to Moab for this vacation drove their bone stock rigs and a few like Steve Nelson were still running street tires and no lockers. 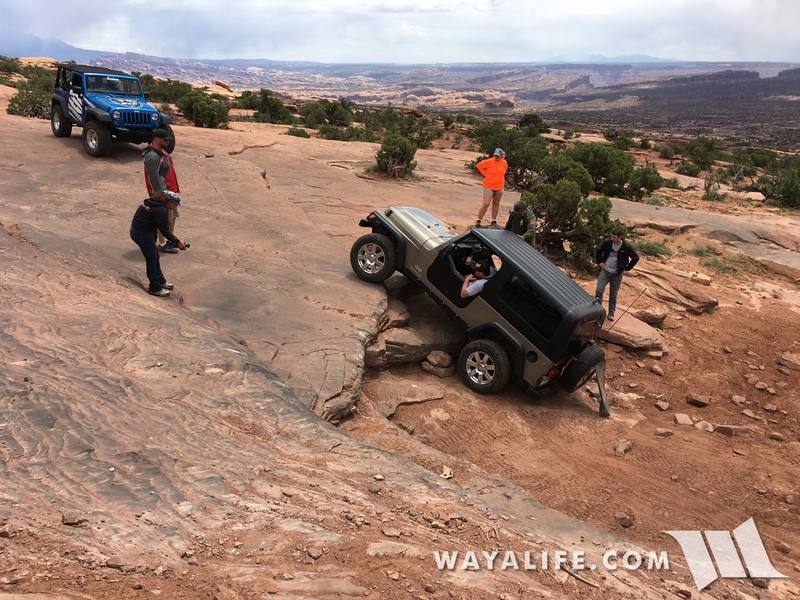 Here's a shot of him giving a harder line a go up the Z-turn. 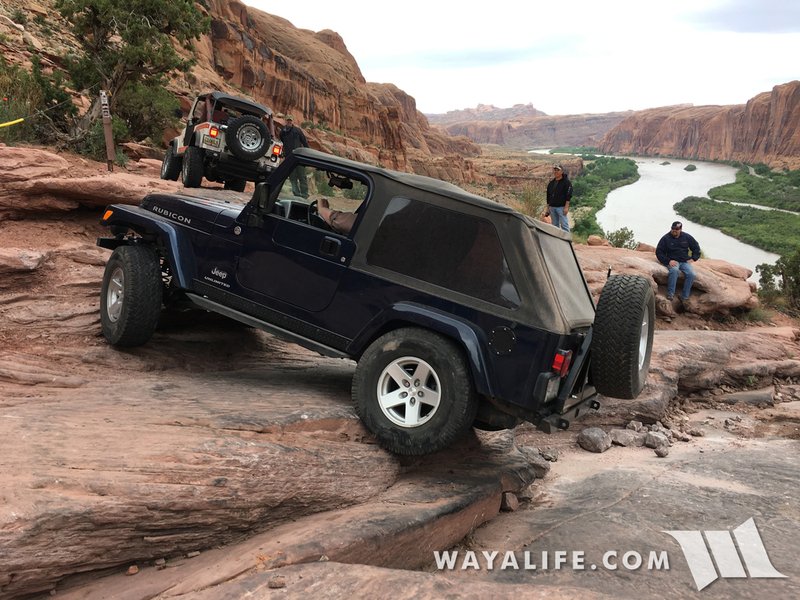 Yup, you're seeing right, this is Dave back on the trail with us and having a good time. 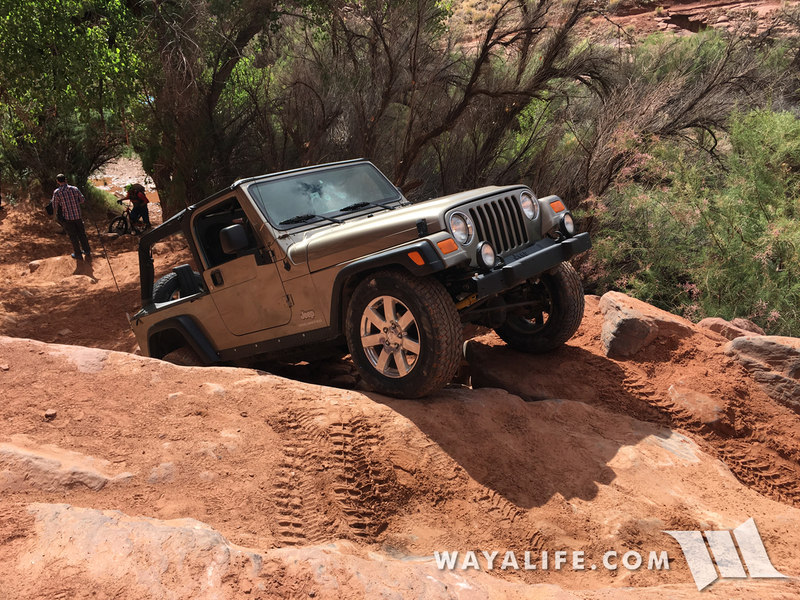 Cindy climbing her way up the steep side of the Z-turn. 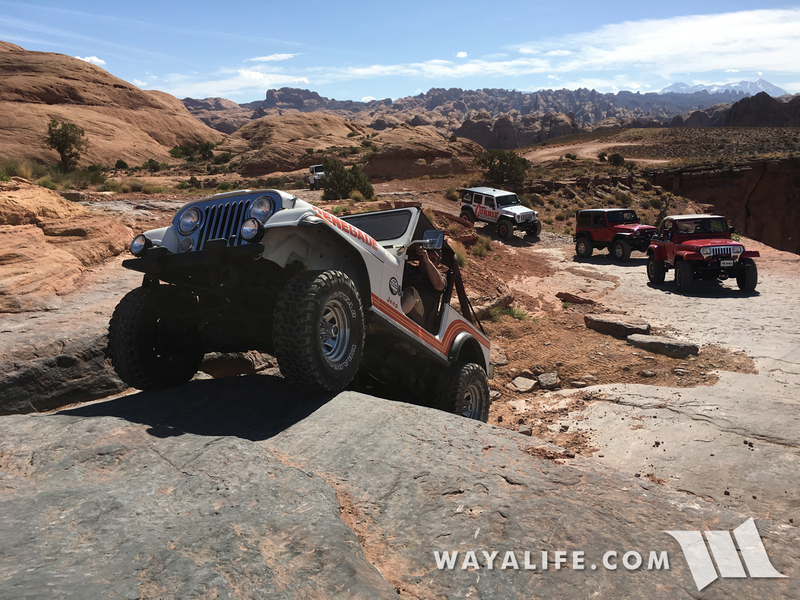 Aleksander giving it hell taking on the steep line up the Z-turn. John Currie walking up the Z-turn like it wasn't even there. 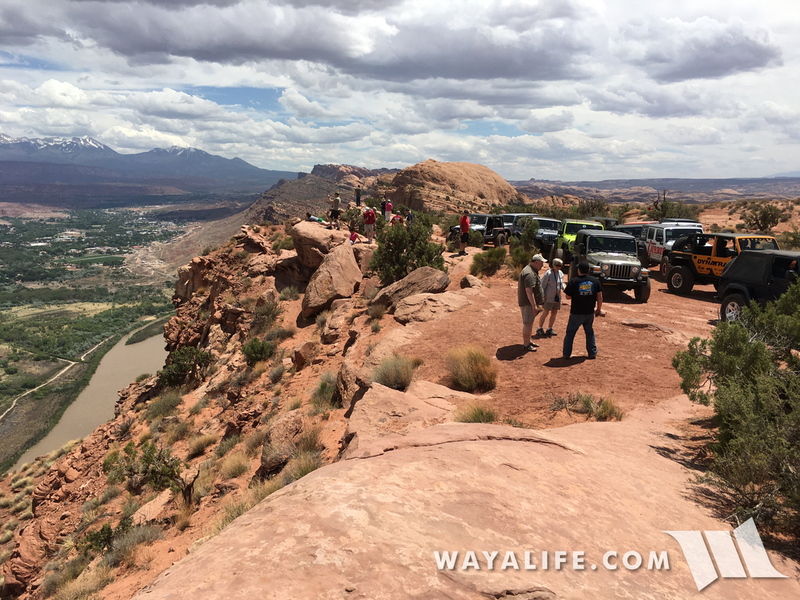 Lunch time at the top of the overlook. 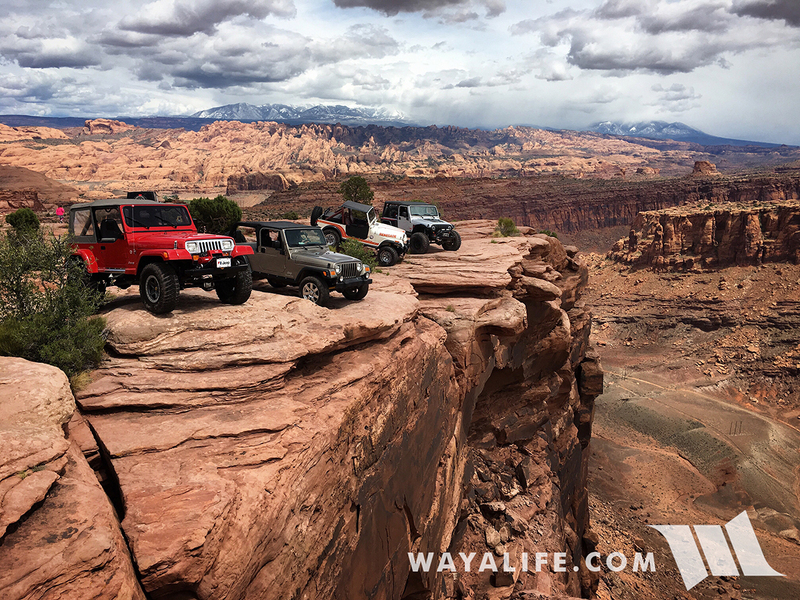 You just can't beat the views from up here. 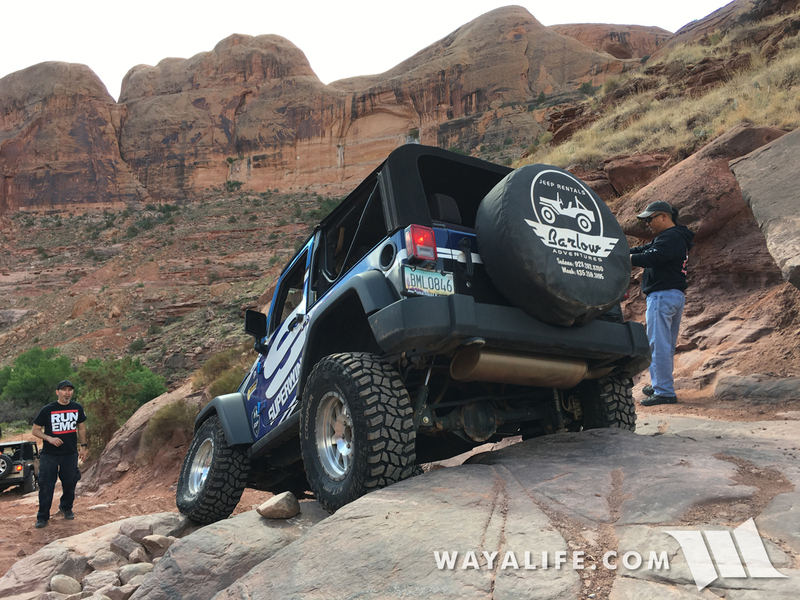 And finally, taking a break over by the Goonie Bird rock on our way back to town. 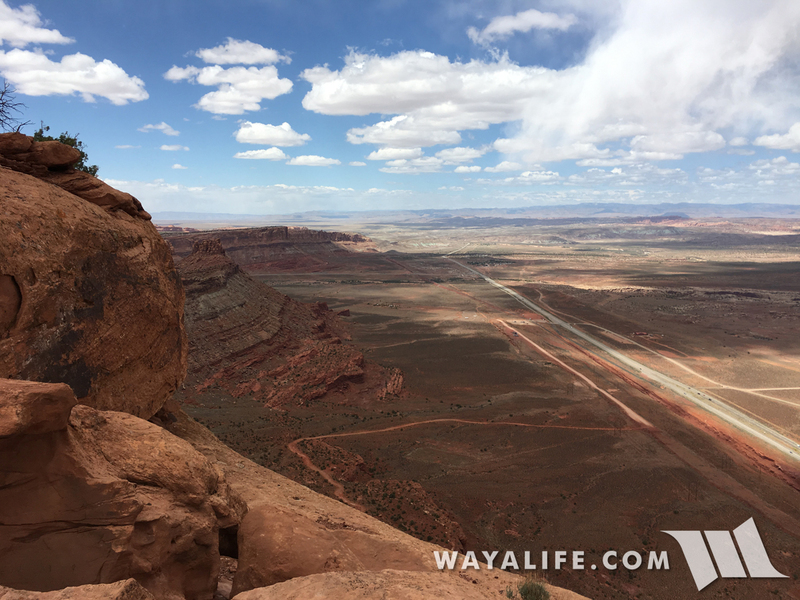 Of all the trails we've run out in Moab, I'd have to say that the Moab Rim Trail is one of my least favorites. 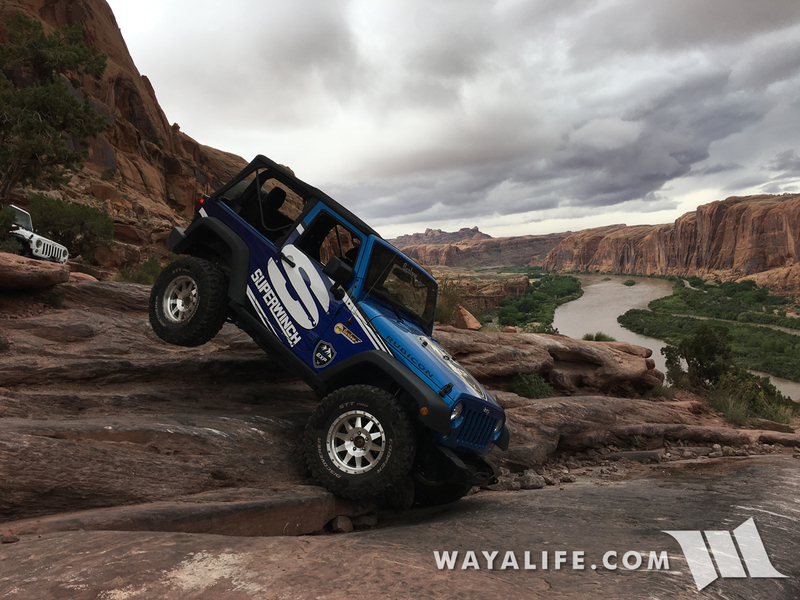 While taking on big ledges is always a lot of fun, doing so on the edge of an off camber shelf road and with nothing but the Colorado River 400 feet below can definitely mess with your head. 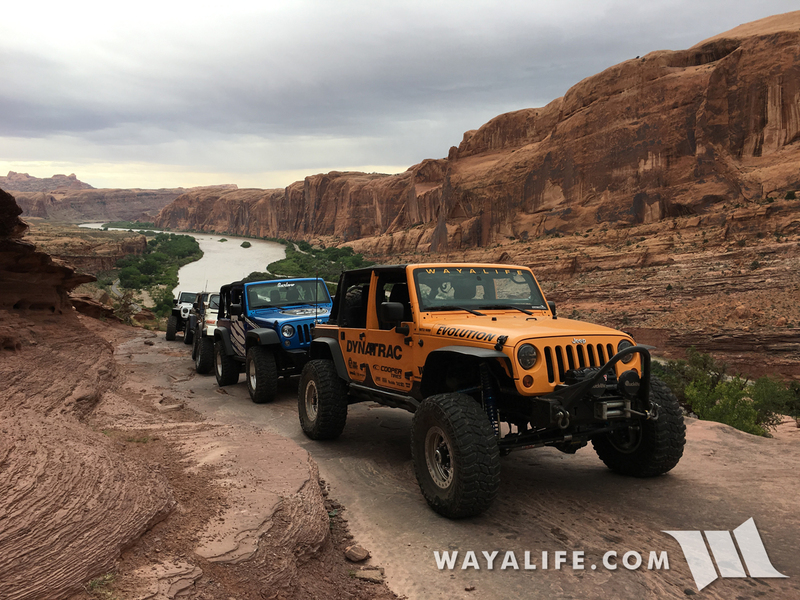 As you can guess, this is where we decided to start our third day out in Moab and as luck would have it, with rain starting to fall just to make things interesting. 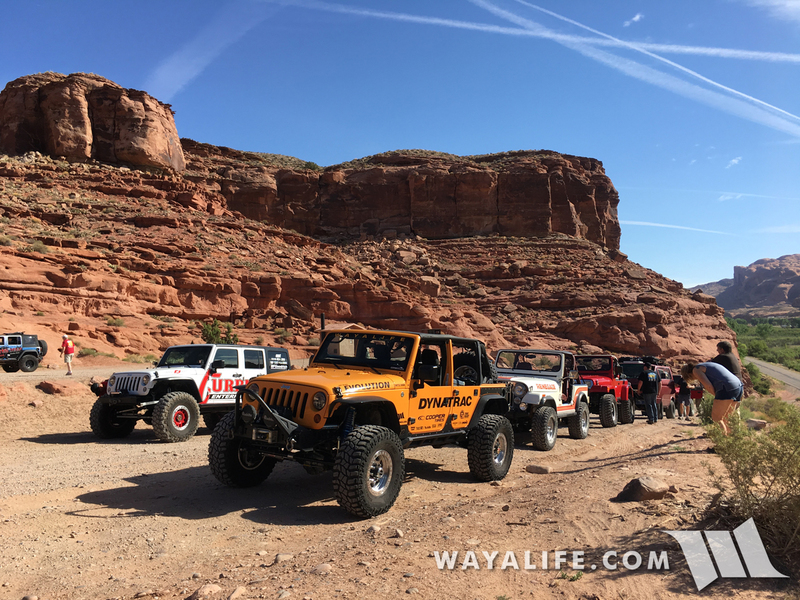 Here's a shot of us getting setup down at the staging area. 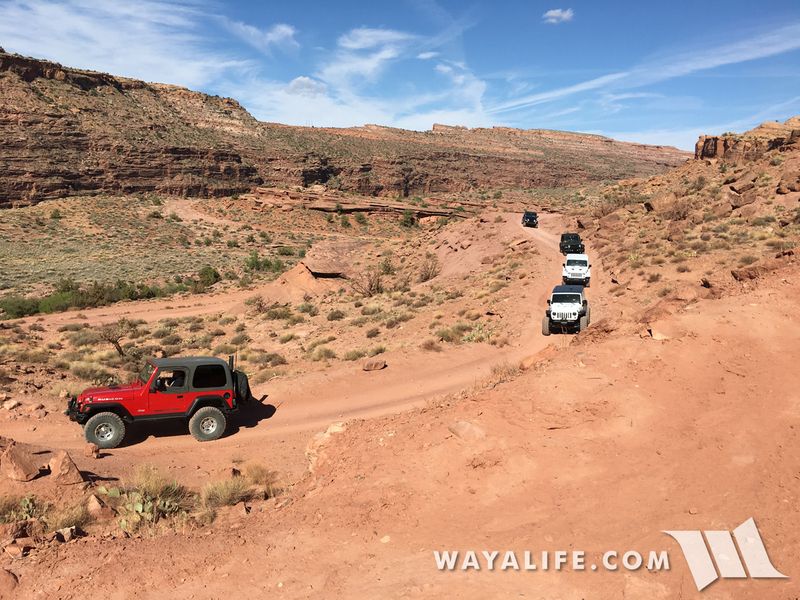 Starting our climb up the Moab Rim Trail. 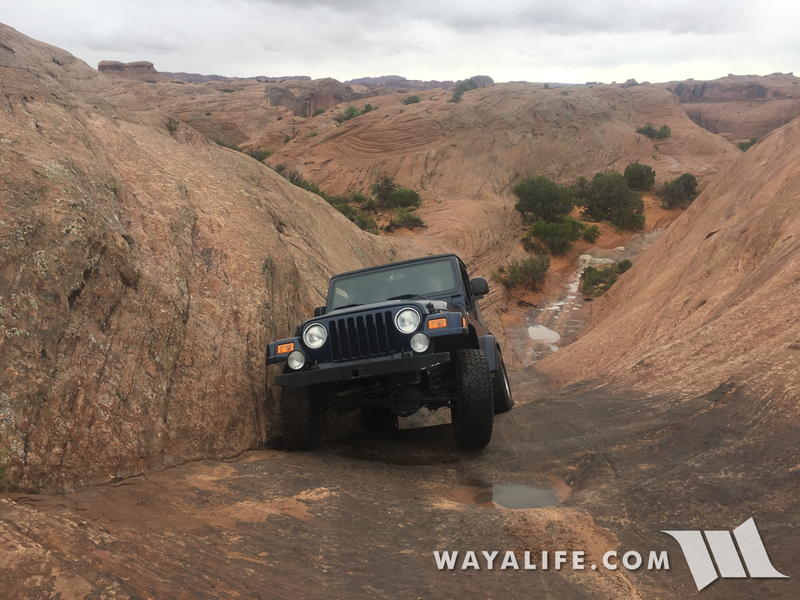 Shot of John flexing his way up the crack. 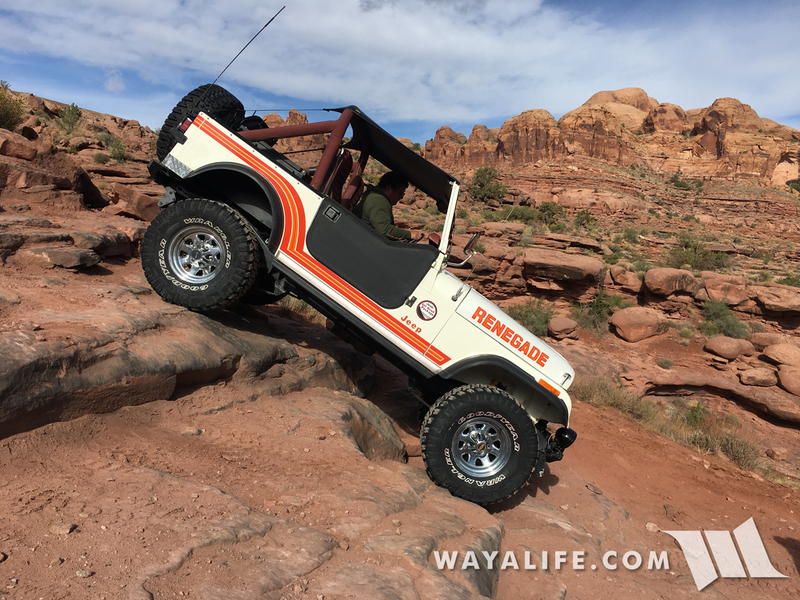 While you would think an old CJ7 would be at a disadvantage on a trail like this, Jim climbed up everything like a billy goat. 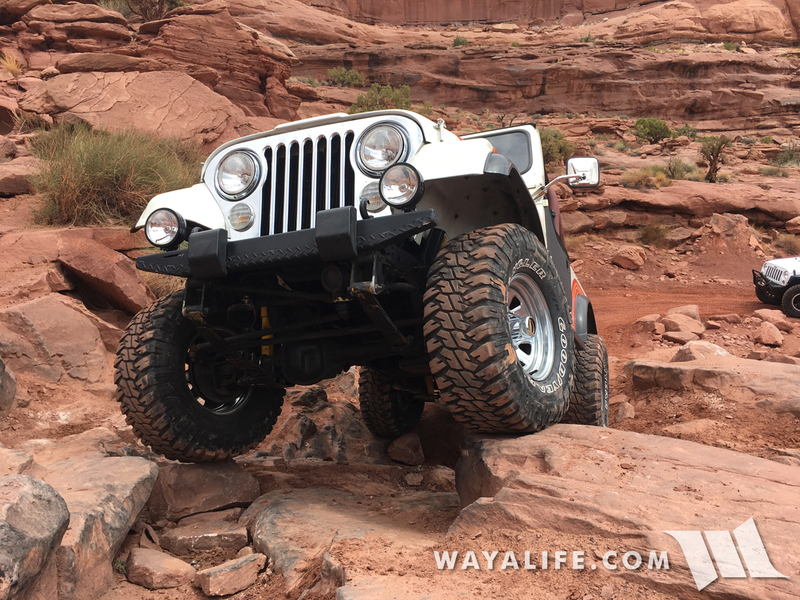 Chris Rettenmaier is another Jeep guy that drove out his bone stock LJ Rubicon and was proud to be wheeling it up everything. Group shot of the gang! 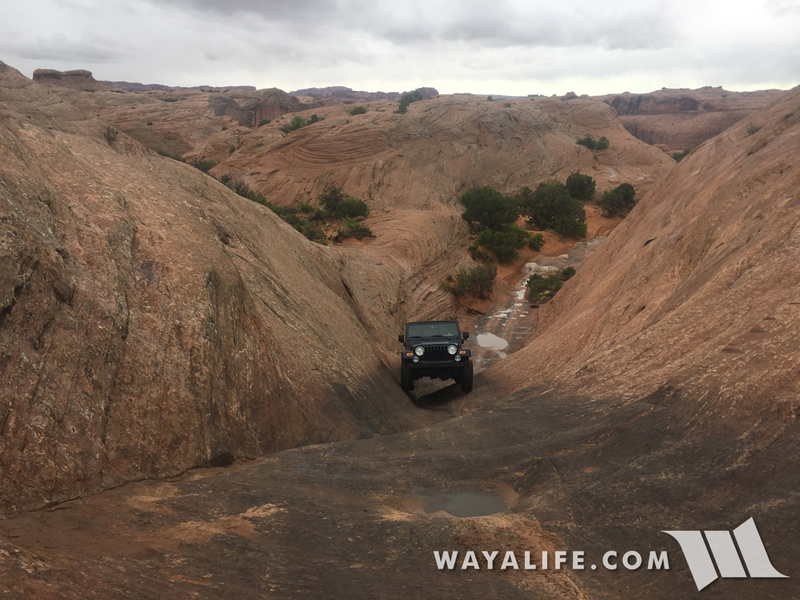 It was a bit too cold, windy and rainy up on top on top of the mesa and so instead of finishing up the loop, we decided to make our way back down. 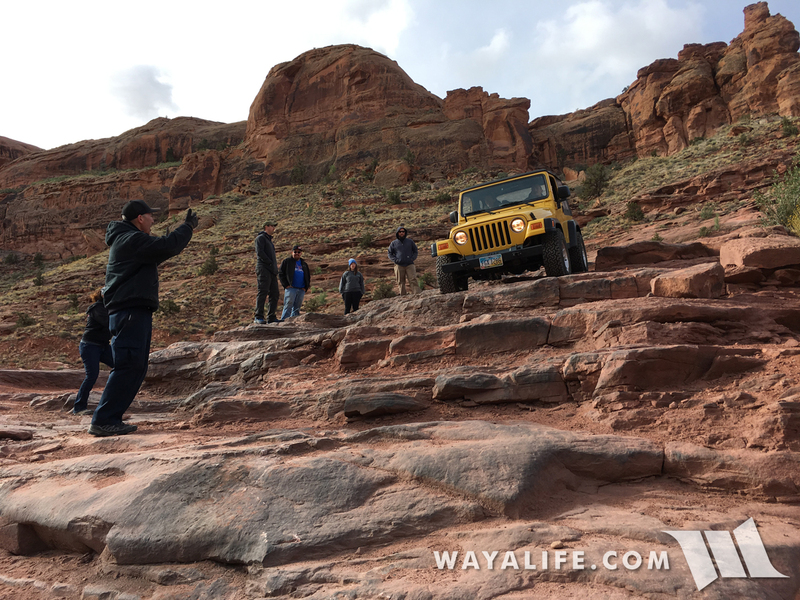 Tony (Denise's stunt double) behind the wheel and giving us a show as he made his way back down the Z-turn. The end of the trail just ahead. The second half of our day would be spent running Hell's Revenge but by then, the rain really starting coming down and little time was spent making stops for photo ops. 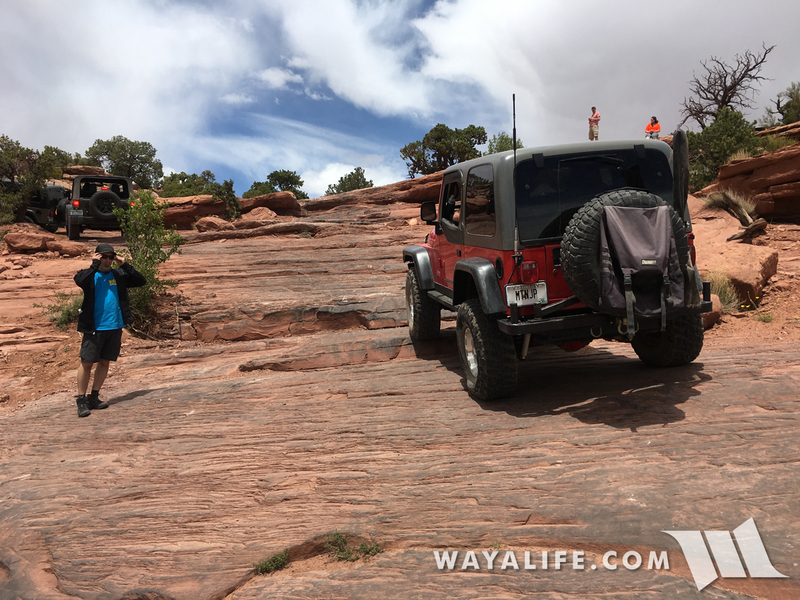 Needless to say, the first real pics we were able to take out on the trail was over at Hell's Gate. Here's a few shots of Aleksander taking it on. Here's a few of Chris taking it on too. 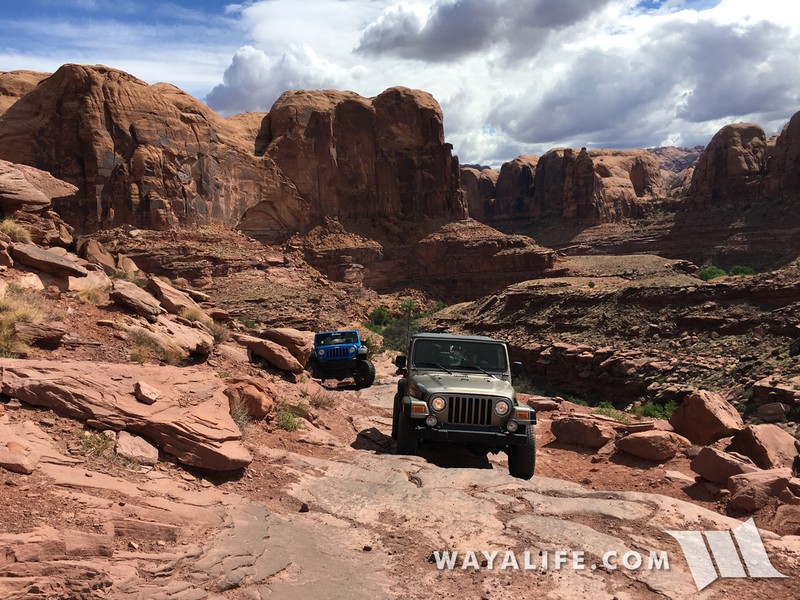 Pulling up to the overlook. 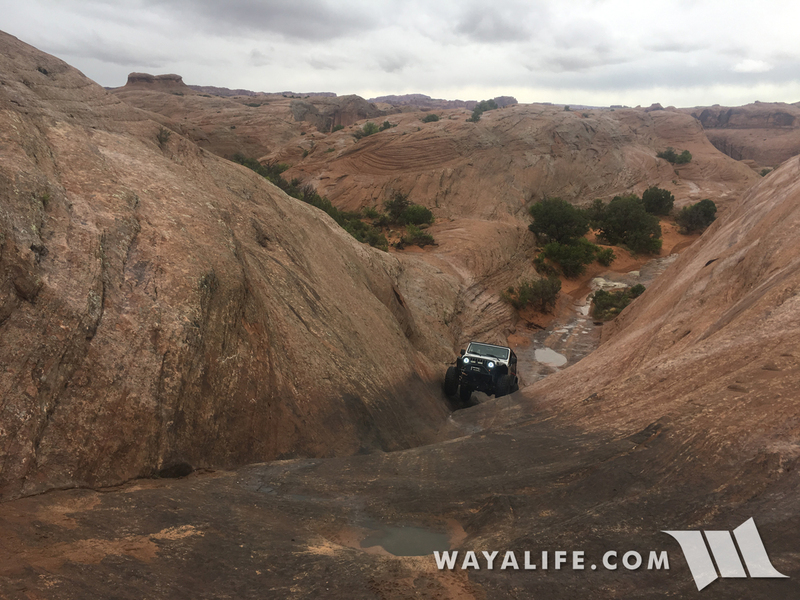 Chris taking a plunge on our way back off the trail. 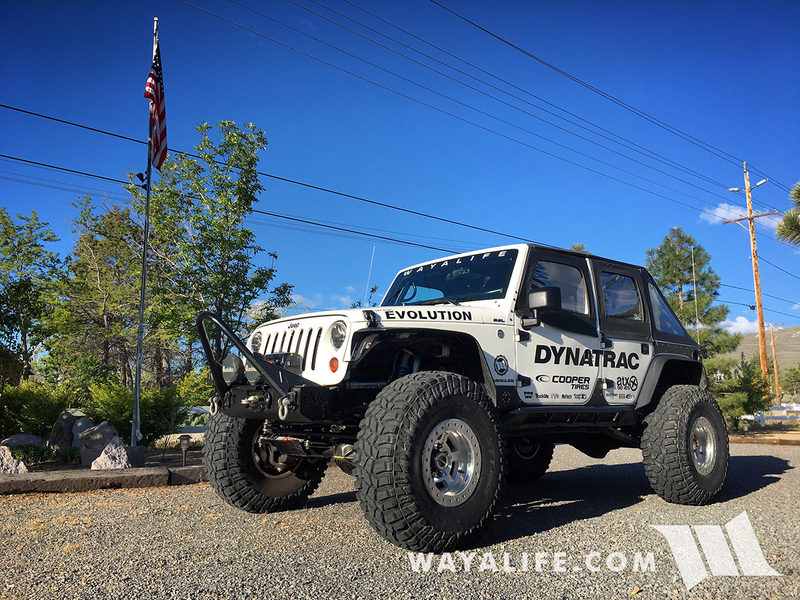 Brandon is with Jeep brand marketing and is yet another proud owner of the vehicles that they make. 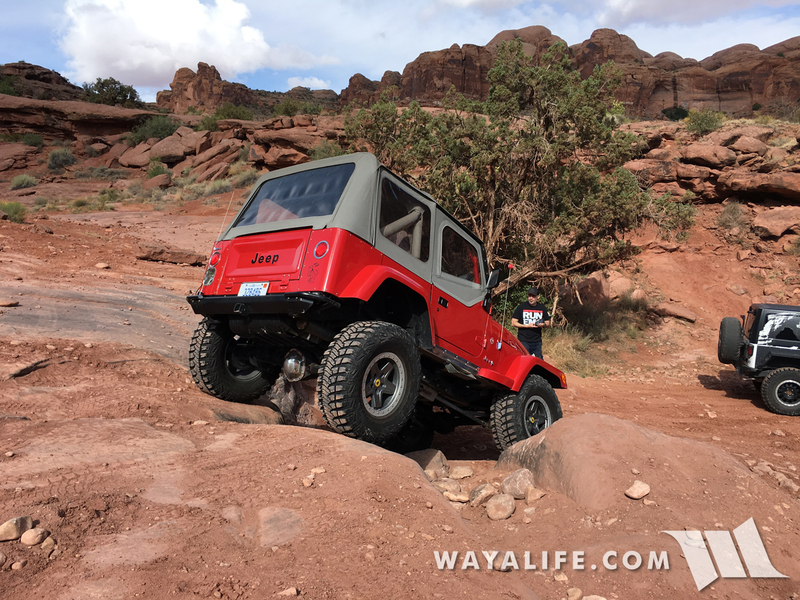 Here he is in his bone stock JK Willys he drove out to Moab in and to wheel it. And finally, Bob making his way down. 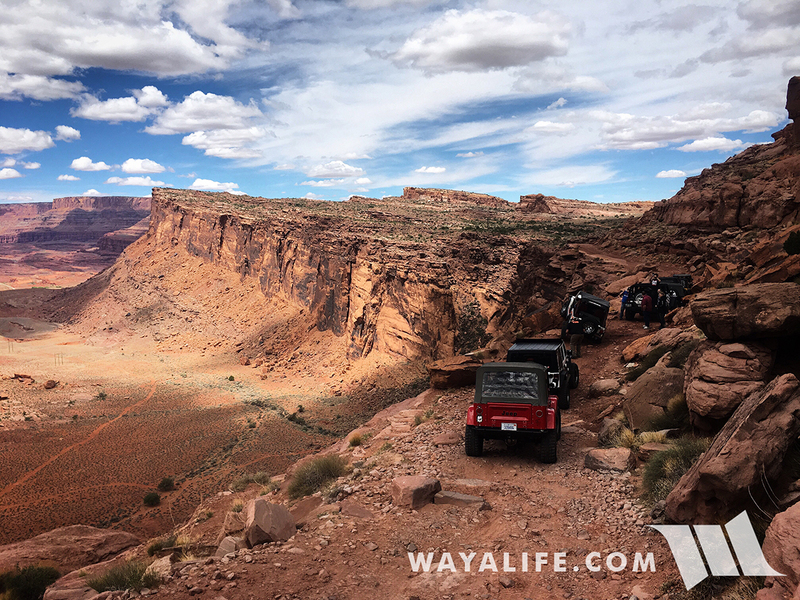 With crazy high steep cliffs you get to drive along, breathtaking views the whole way through and a good mix of optional challenging obstacles you can take on, Cliffhanger is without question one of my all time favorite trails out in Moab. 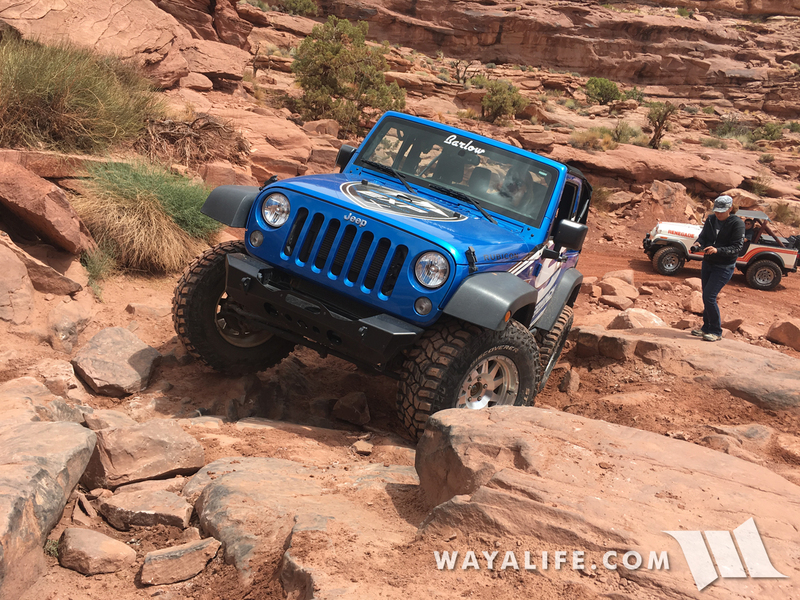 As luck would have it, that's where we'd be spending our 4th day and with Rubicat in the lead. 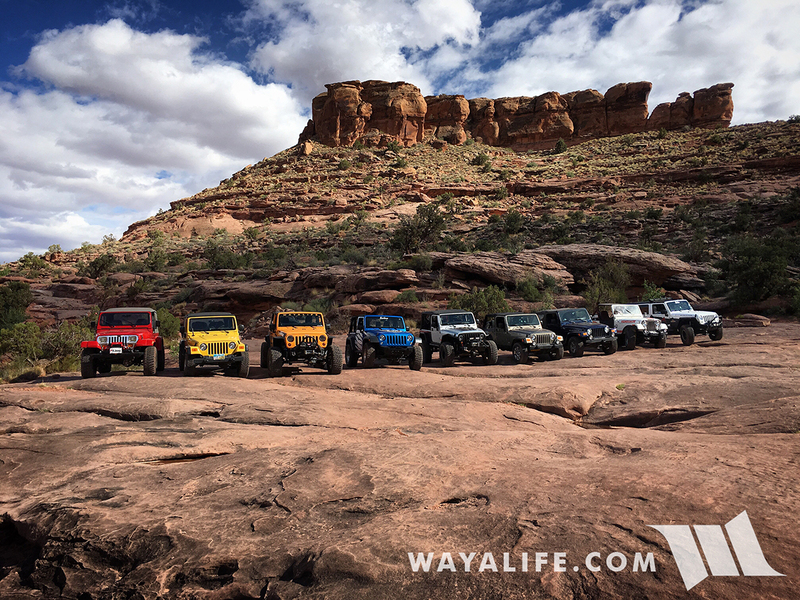 Here's a shot of us out at the trailhead getting ready to have some fun. 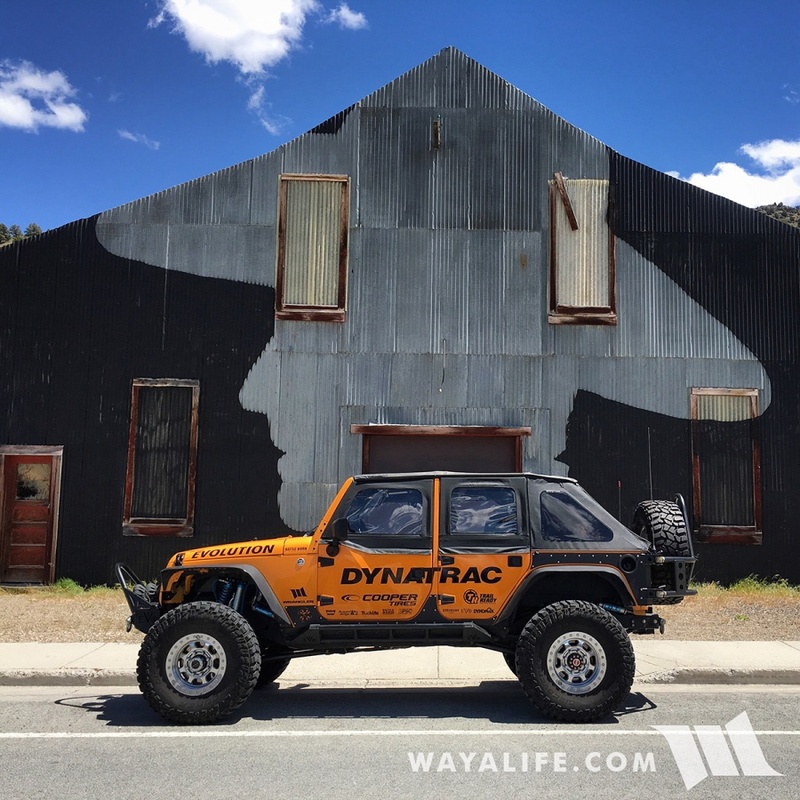 Sean Mahoney is a former Jeep vehicle engineer and again, someone who's proud of the vehicles he worked on. 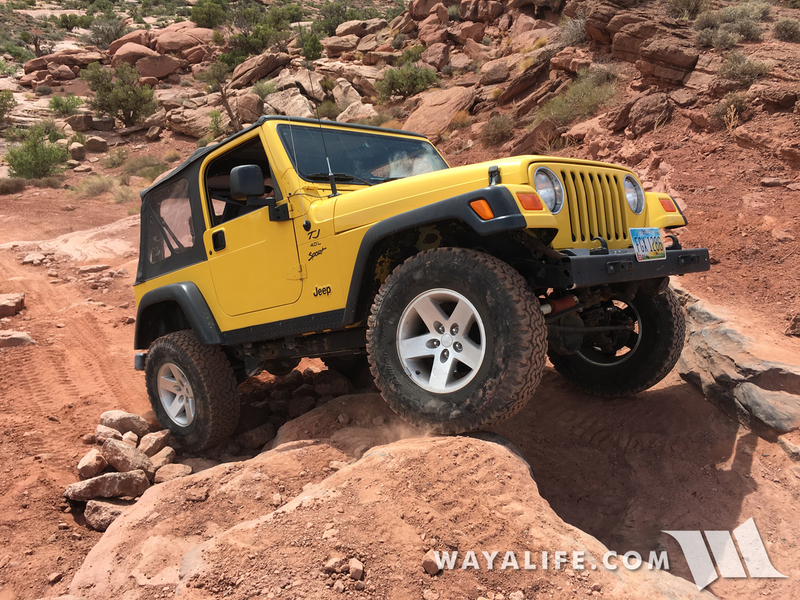 Knowing they are made to be extremely capable right out of the box, that's how he prefer to wheel them and that's what he drove out to Moab in - a bone stock 2000 TJ Sport. 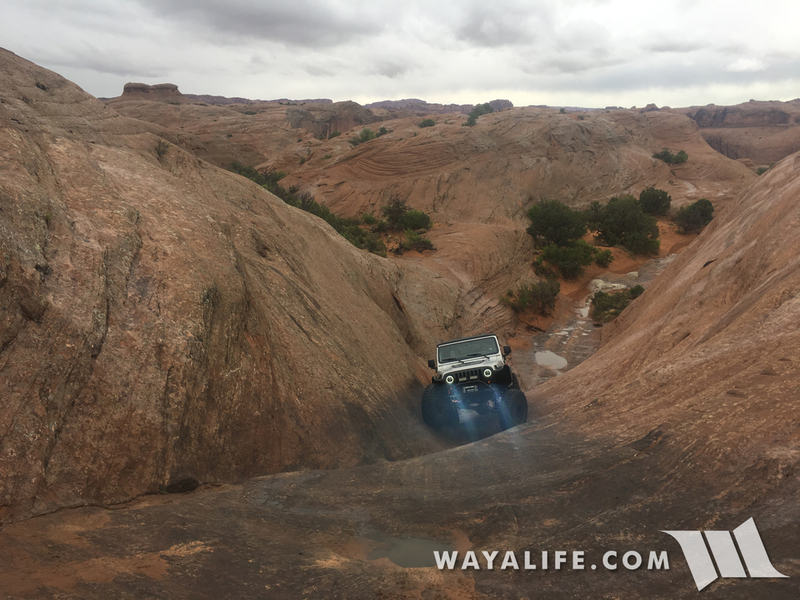 Here's a shot of him dropping into the trail. Keeping up with the stockers, here was Steve. 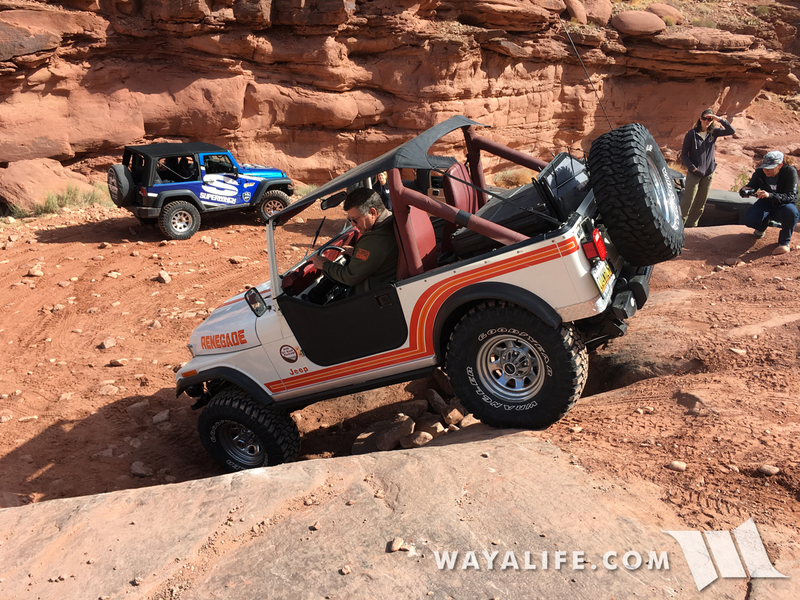 Jim keeping it real and making me want to try this in my CJ. 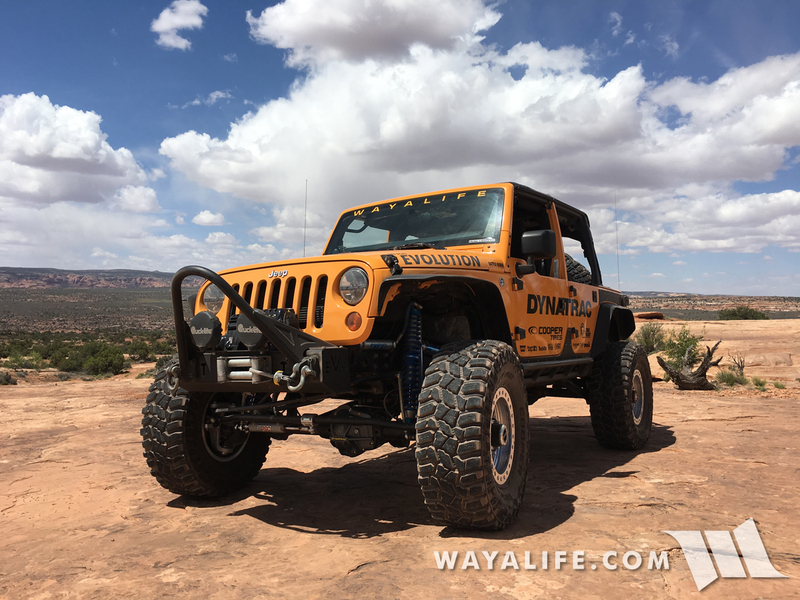 I can't say there's ever been a time when Dave's YJ looked dirty. Cindy getting ready to drop in on the steep side. 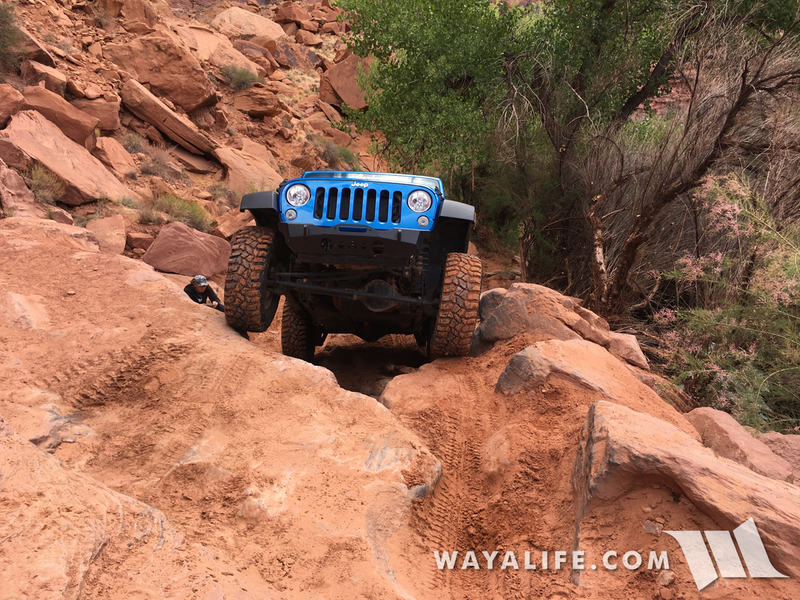 Wiggling down to the creek with a little spotting help from Tony. 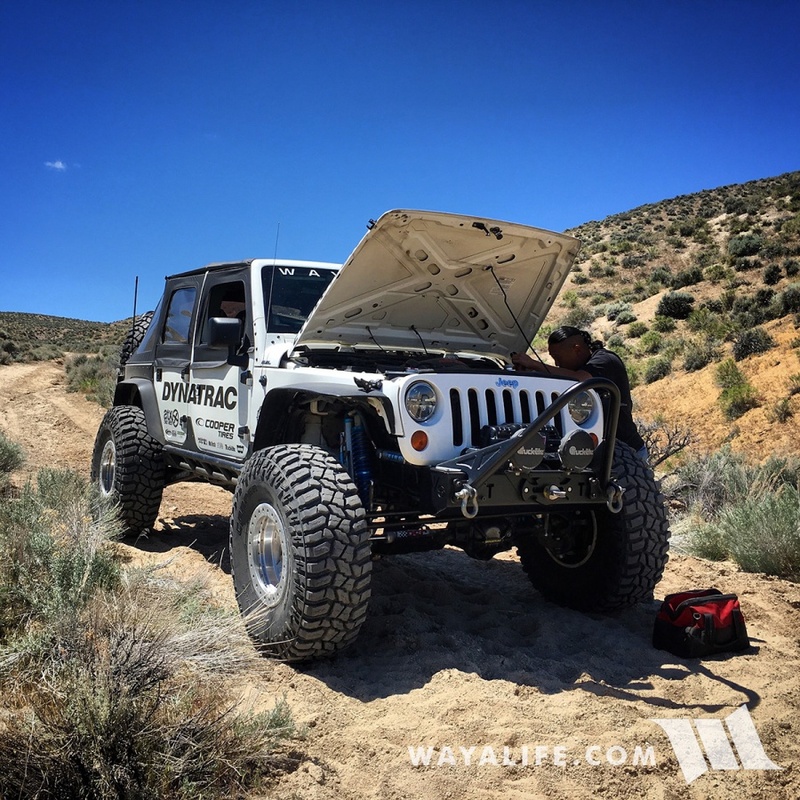 Rubicat taking a moment to reflect down by the creek before taking on the next obstacle. 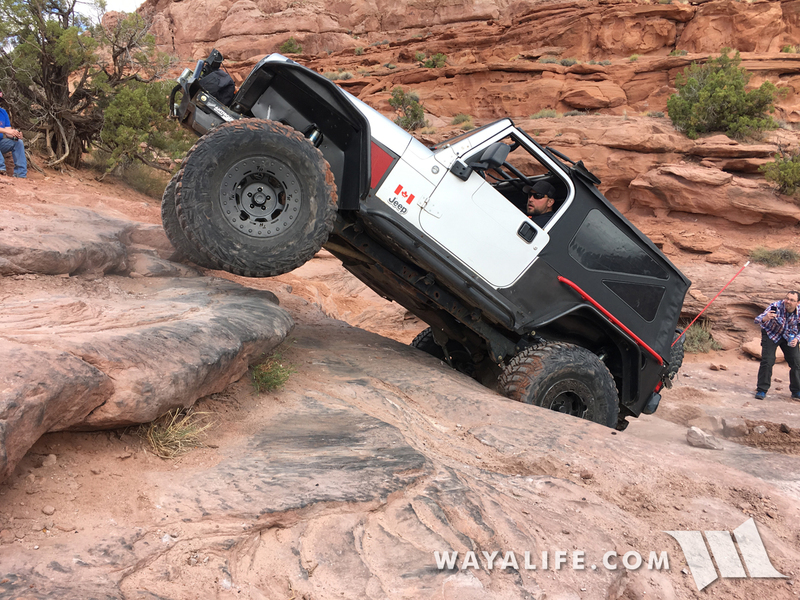 Cindy taking Rubicat up the high side. Aleksander making us hold our breath as he made several dramatic attempts at it. 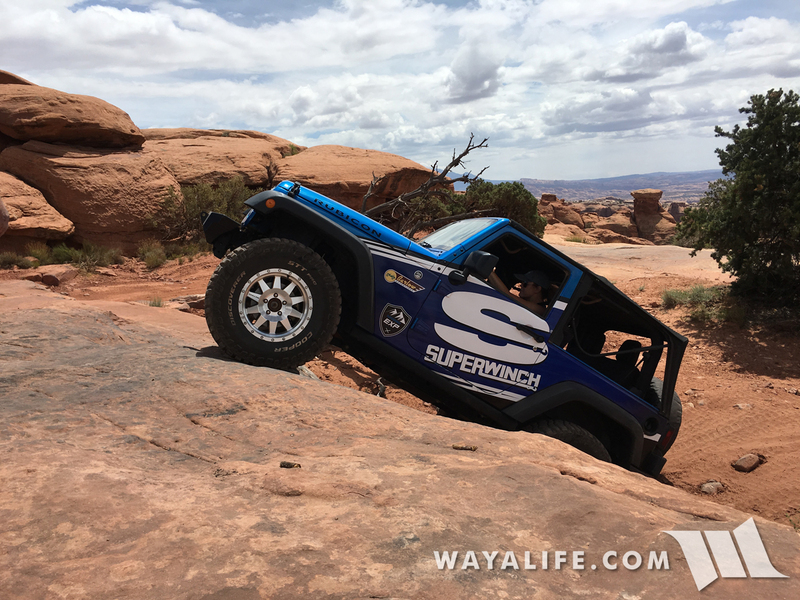 While the steep side was optional, the main route up can still be a challenge but Steve was able to give it just the right bump up. Denise doing a great job climbing up as well. 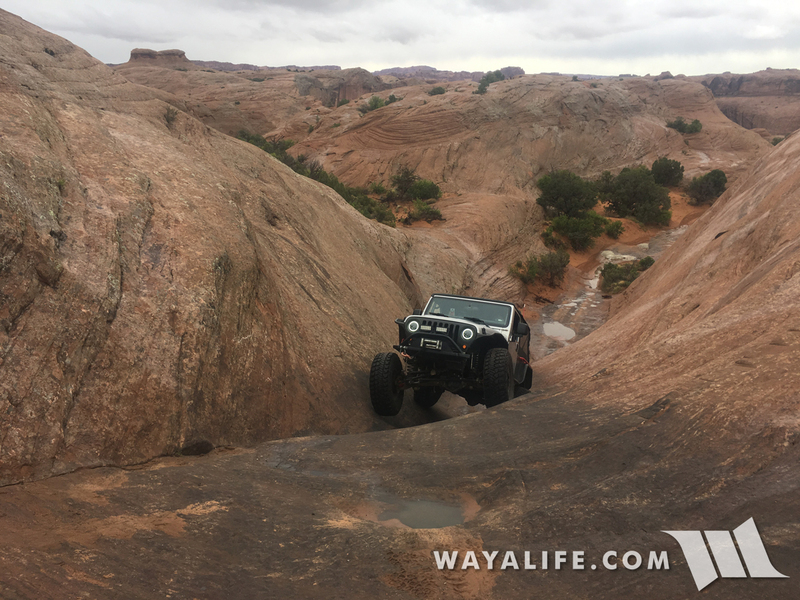 Bob climbing his way up. 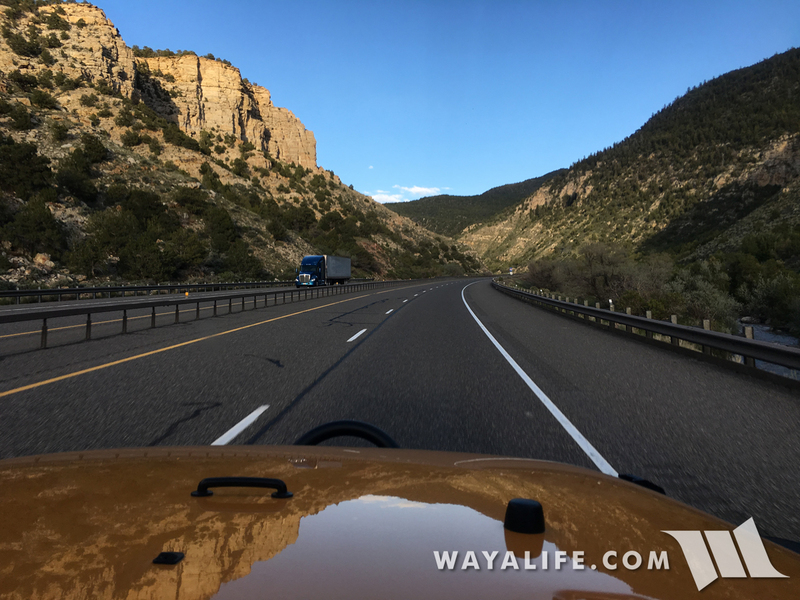 Working our way up the beautiful canyon. Being the bad influence that I can be, I encouraged Aleksander to give the double ledges a go. 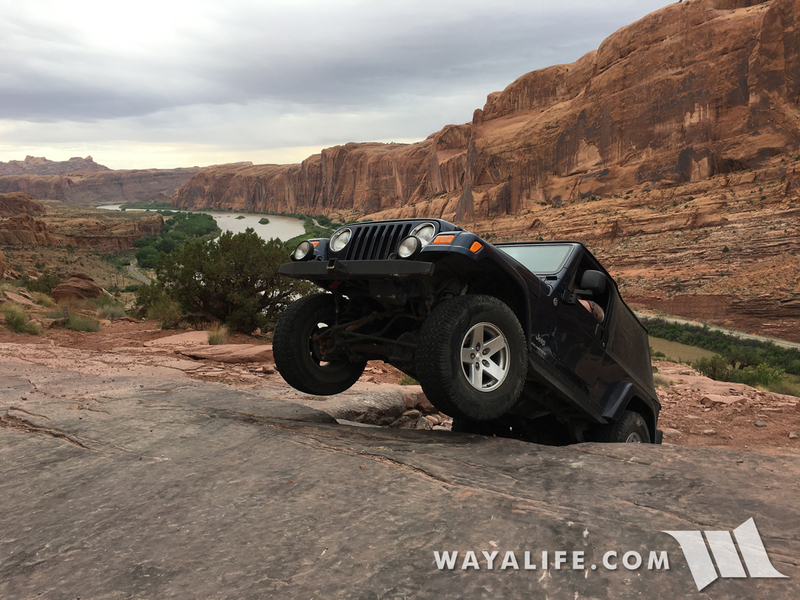 A couple of time, he got really close but smartly decided to just go around it instead of keep trying till something broke. Almost to the top, Cindy starting her climb up the Z-turn. 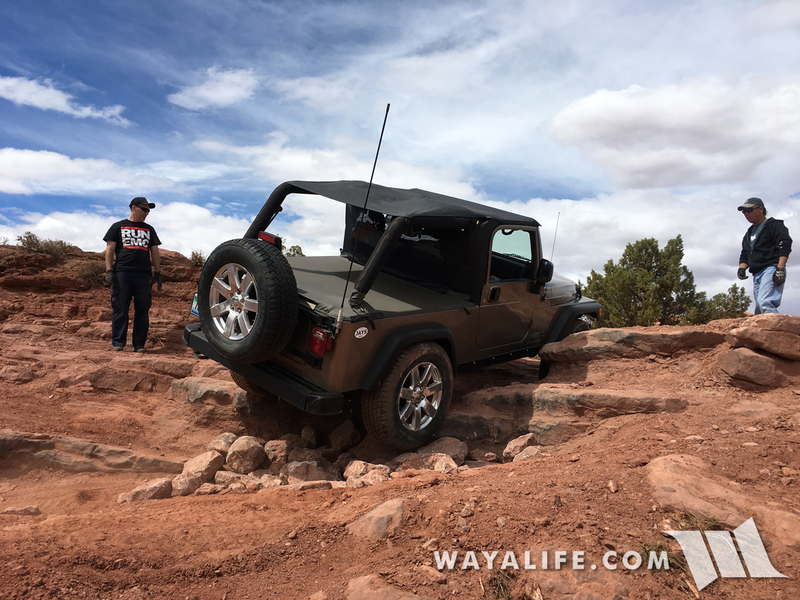 Sean negotiated his way up the Z-turn. Aleksander taking on a harder line. 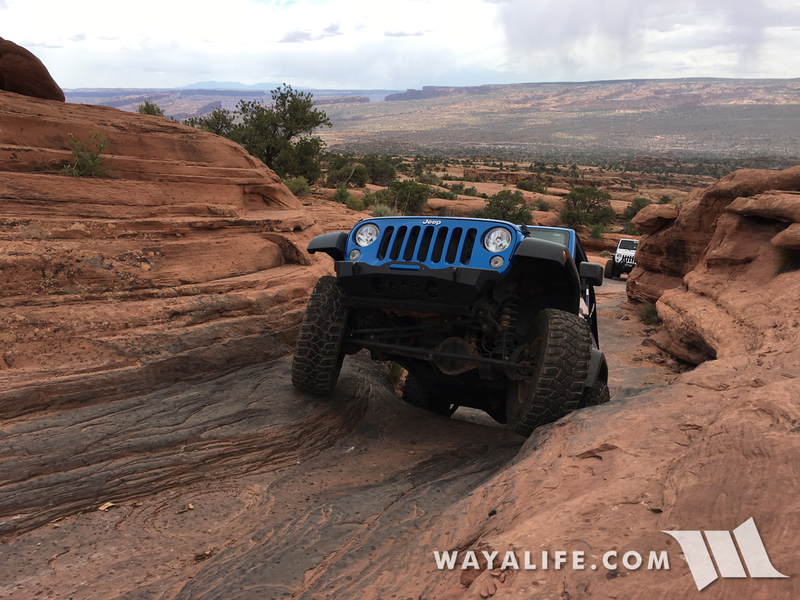 Steve kicking up some dirt as he gave it a bit more of a bump. Denise rocking it like a pro. 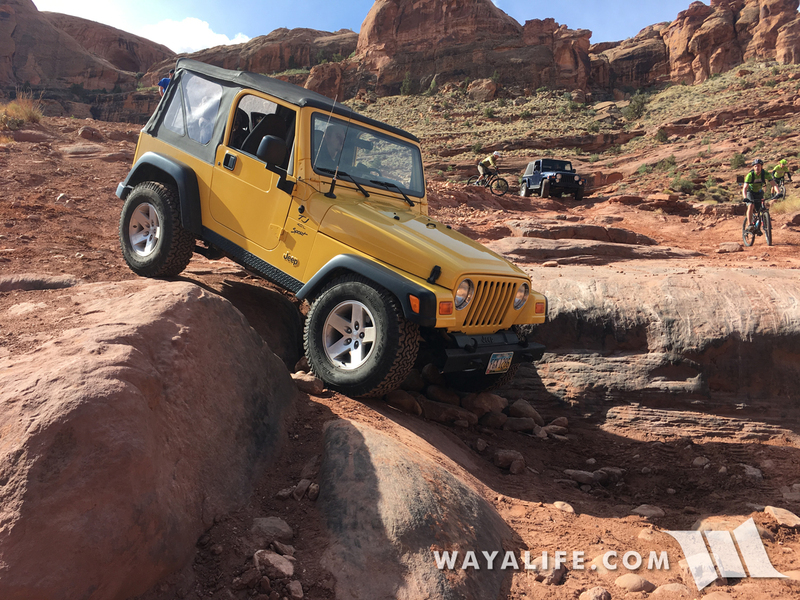 Jim making it look easy. 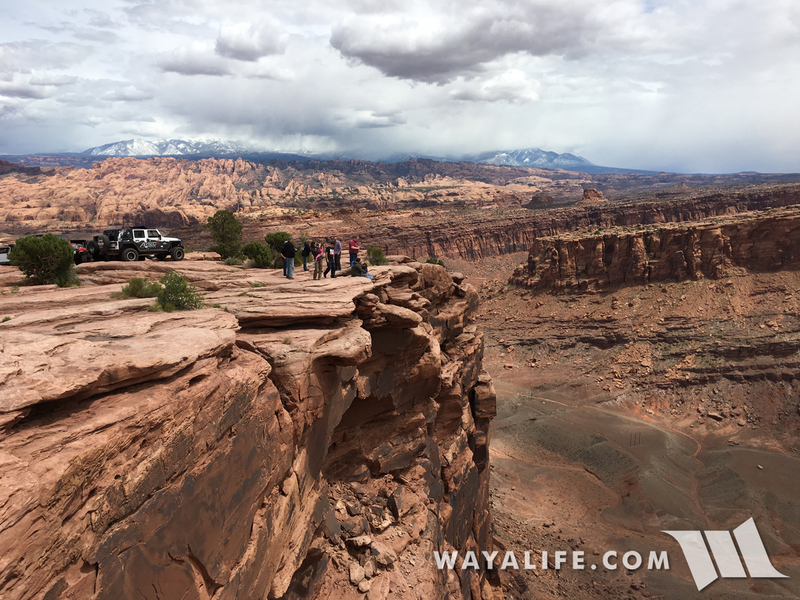 Here's a shot of Dave making his way down the infamous cliffside ledge that Tony was able to take. 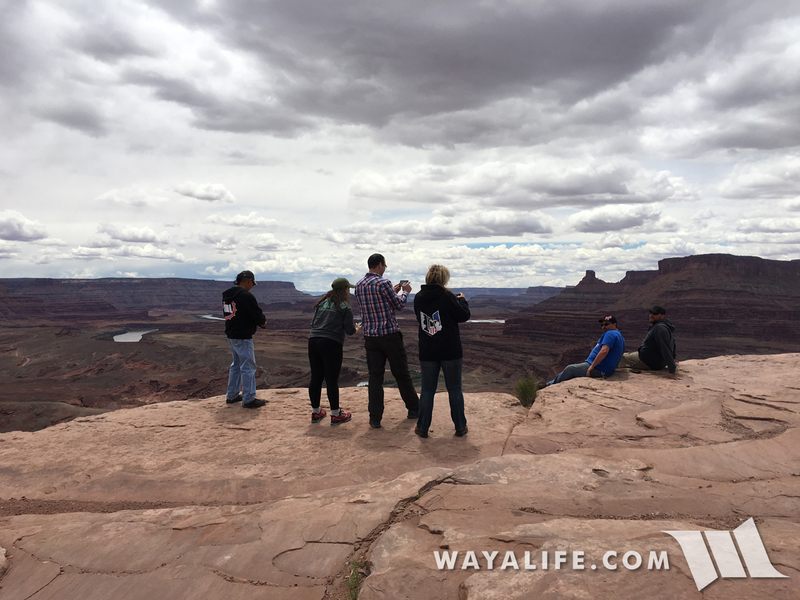 Being that I was spotting, Cindy was filming and a whole slew of side-by-sides were hot on our tail, I unfortunately don't have any other pics of anyone making the drop along the cliff face but here's a shot of us just past it. 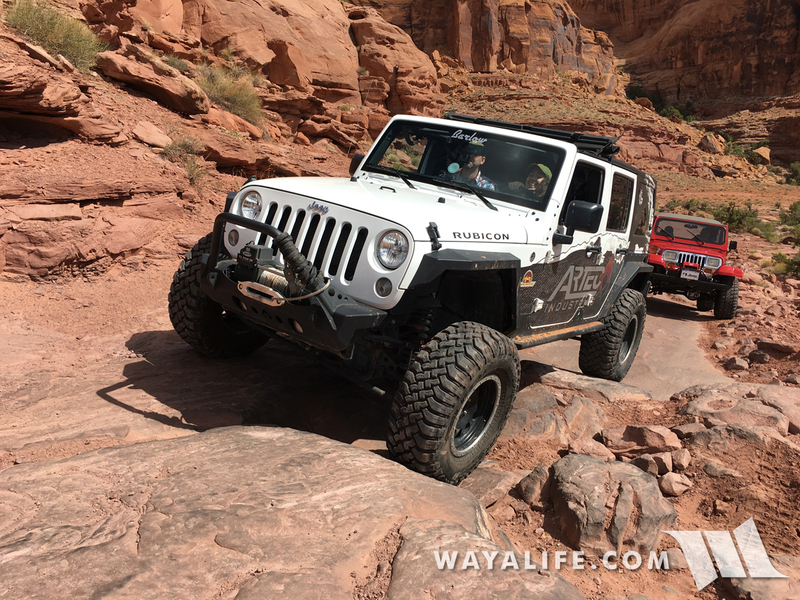 Pulling up to the top of the overlook. 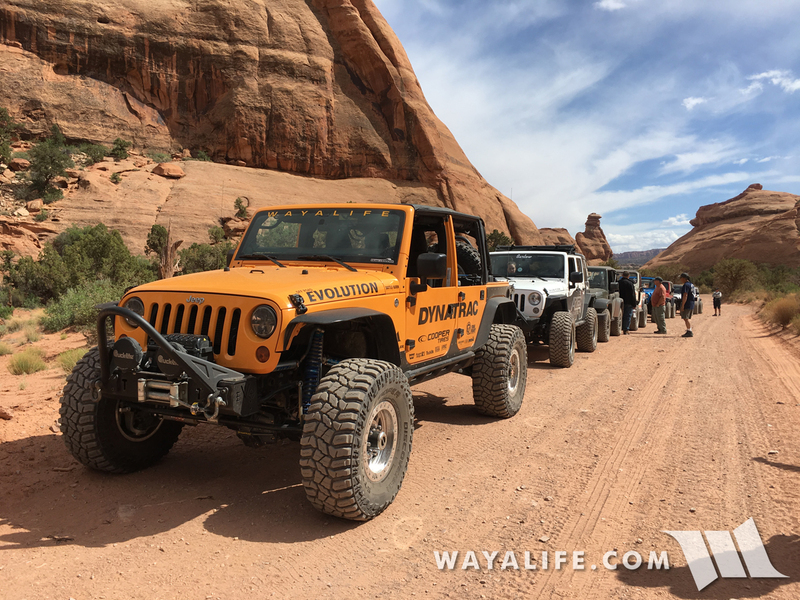 Time to make our way back to the trailhead. 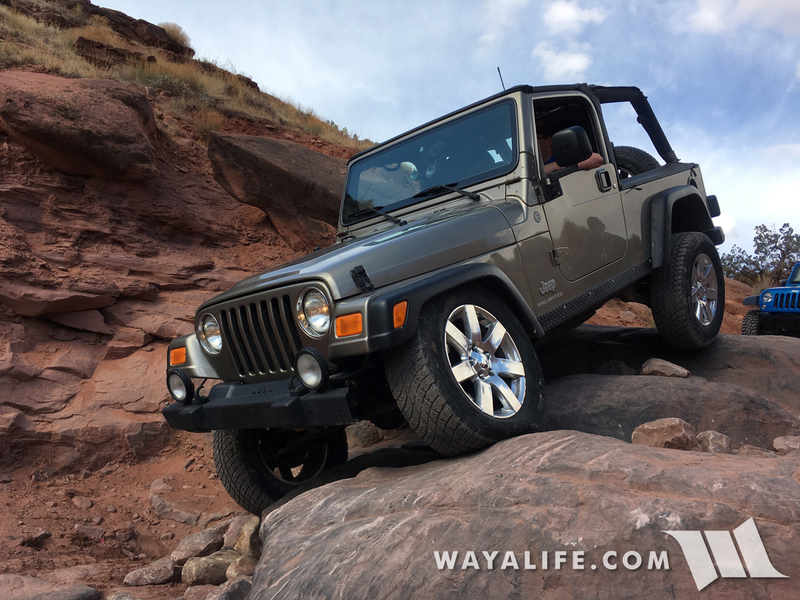 Gotta love watching stock Jeeps wheel. 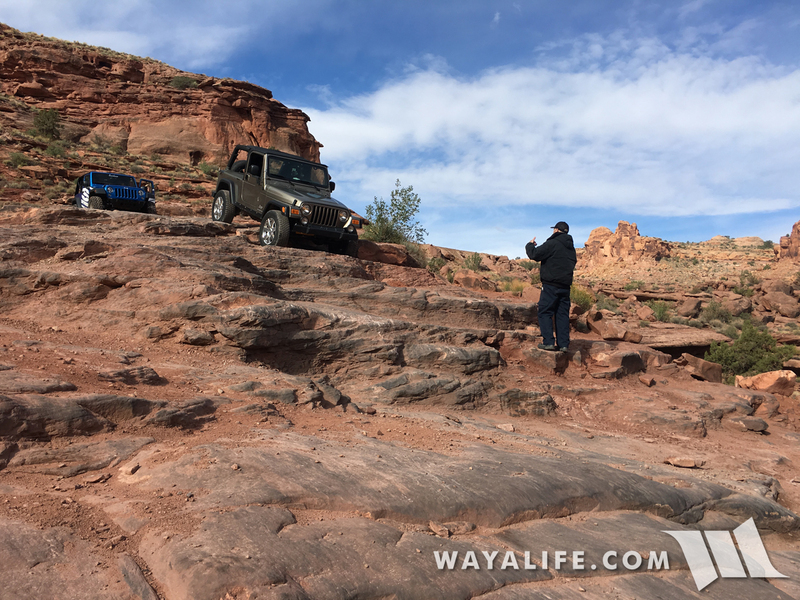 Climbing our way back up the cliff ledge. 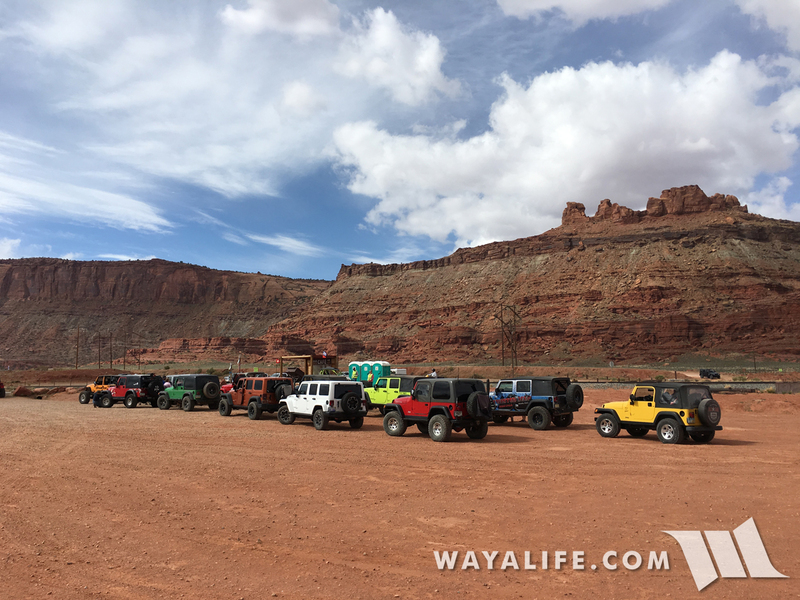 Last but not least, a group shot of everyone who joined us on our final run out in Moab! 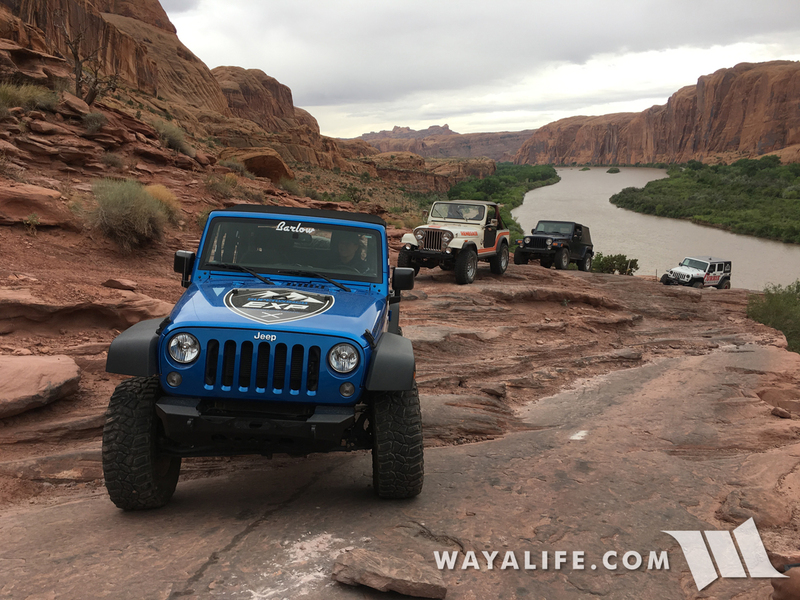 It isn't everyday that you get an invite from the guys at Jeep to spend a NO work, NO stress week of wheeling with friends and family and out in an amazing place like Moab. Needless to say, in spite of the fact that we had just been there a few weeks before and had plenty of reasons to say no, you know this was something we had to say YES to. In spite of all the headaches and troubles we had to face in order to make it happen, I can honestly say that it was totally worth it. 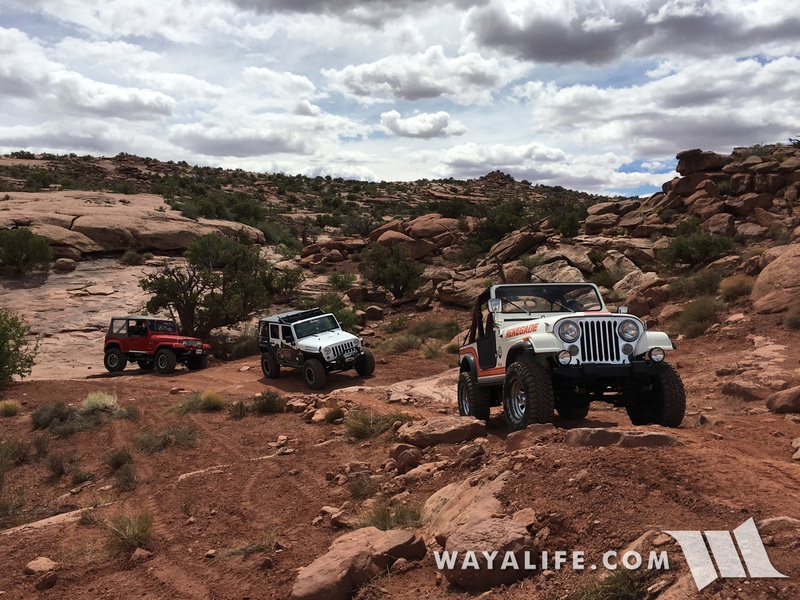 Without question, this was one of the best trips out to Moab we've ever had and we are forever grateful to our good friend Jim Repp for inviting us to join in on the fun. 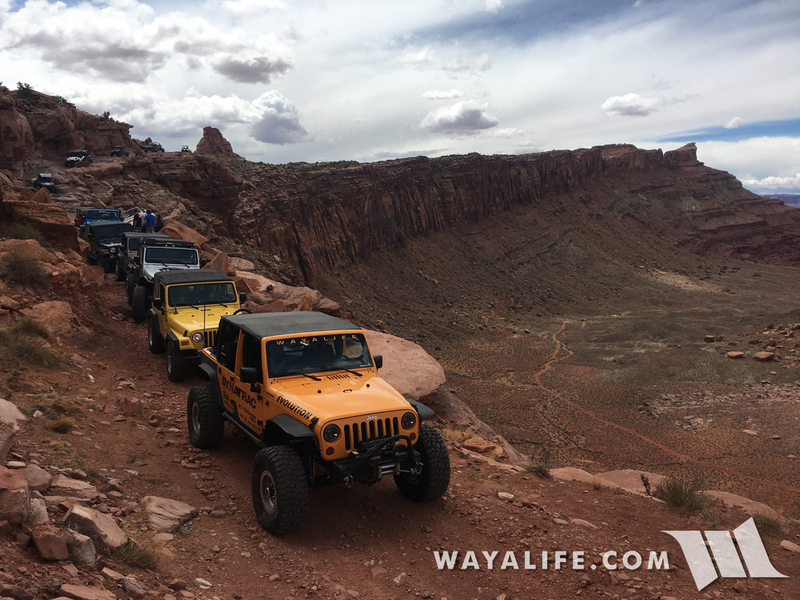 I so hope that we'll be able to do it again if only to spend more time with all the great people we got to meet and wheel with. 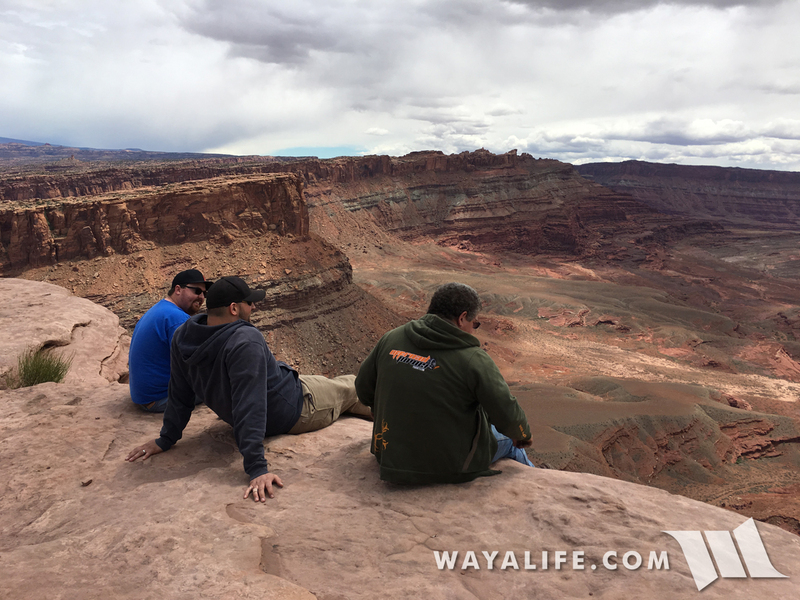 While we were supposed to spend one more day out in Moab, Cindy and I decided to cut our trip a day short so that we could shoot down to SoCal and be witness to the marriage of our good friends Rachel and Ray and celebrate with them on their special day. Congratulations you two! 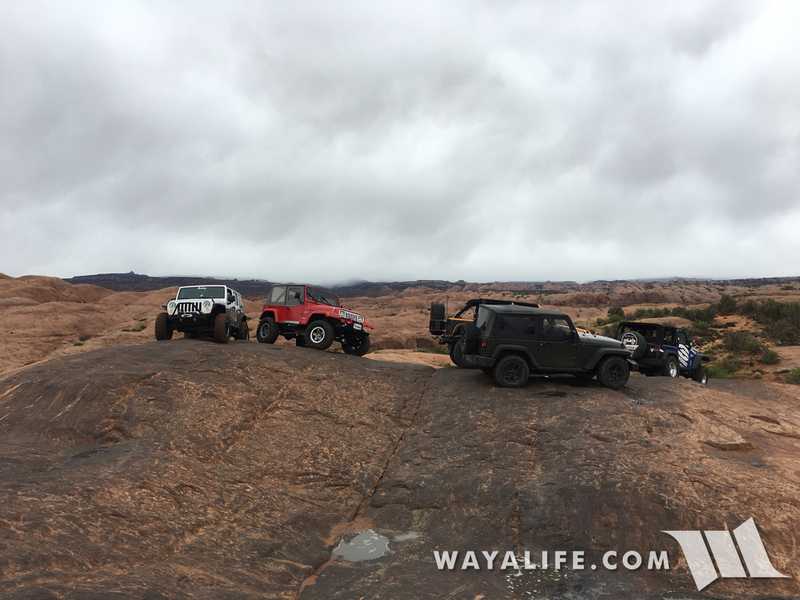 Awesome trip. Looks like you had a good time. 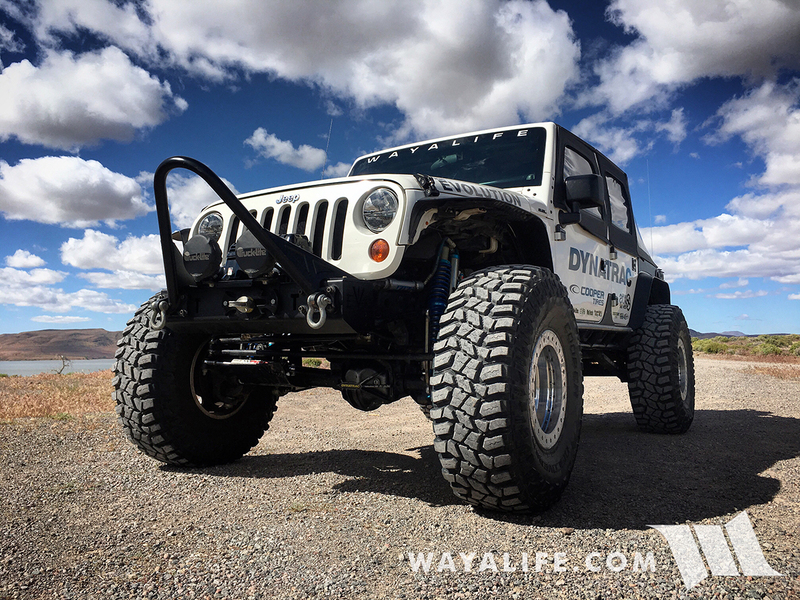 Glad that things turned out OK and hope Moby gets back running soon enough. Congrats again Rachel and Ray!! 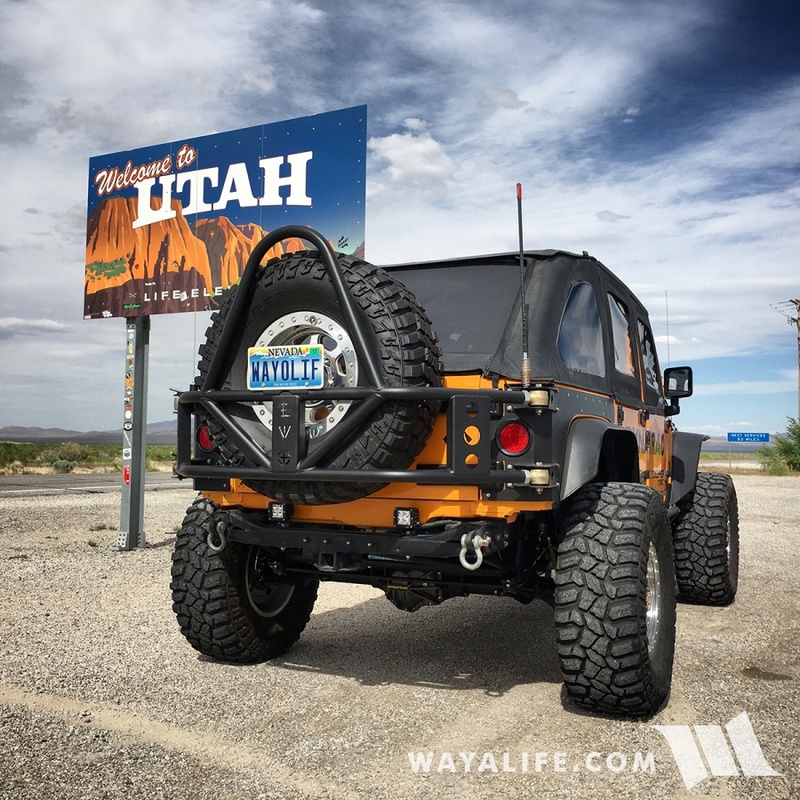 Looks like another awesome trip! Hopefully mint will be back up and running in no time. 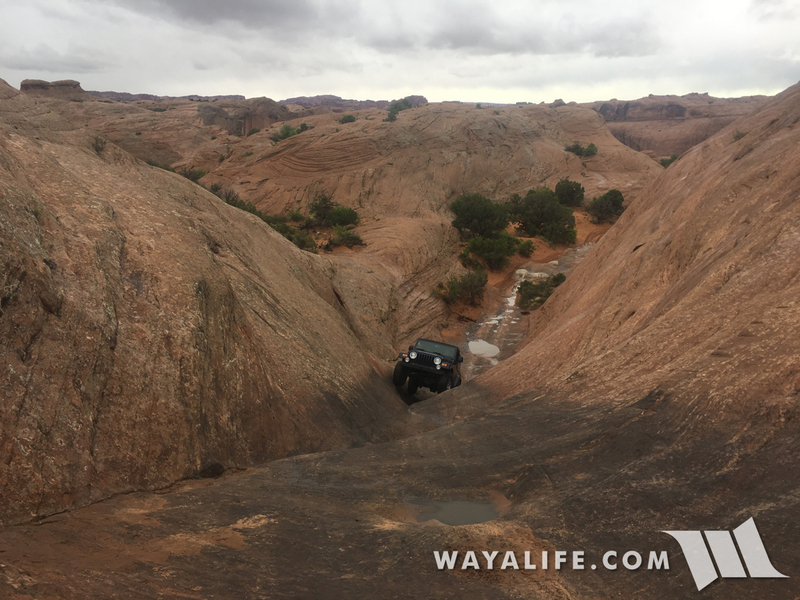 Ahh cliffhanger, one of my favorite trails from my trip with you! 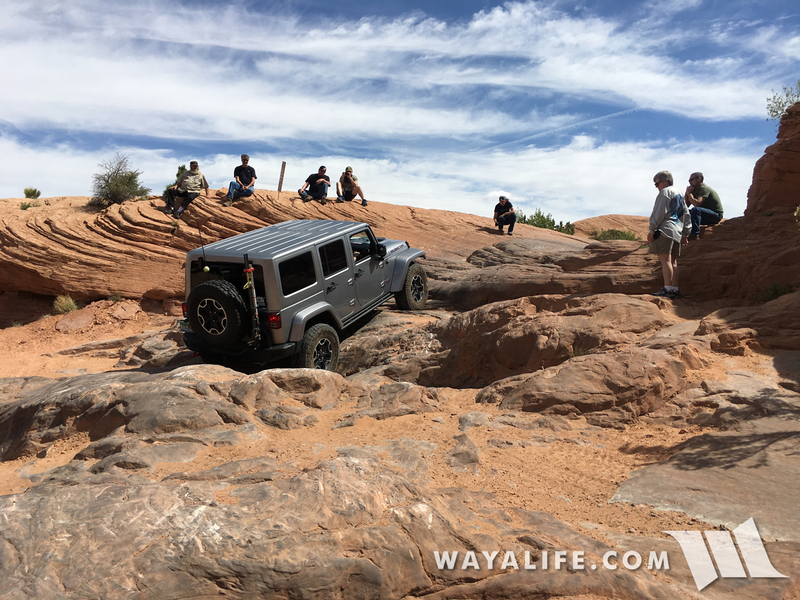 Looks like it was a blast and super jealous you got to hang with Jeep reps! Congrats again to Rachel and ray! So happy for you two!